his education and experience in hospitality to give the Group greater sustainability in the competitive world of hotels. 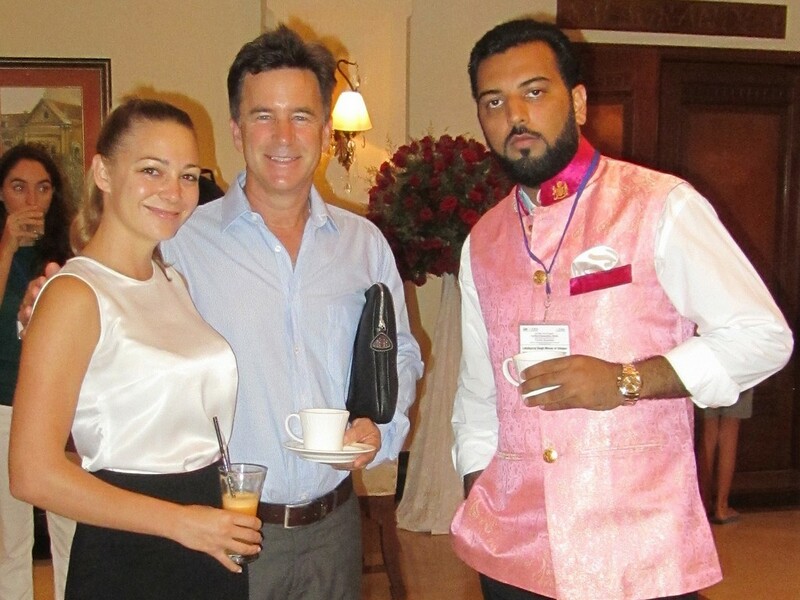 He is also closely associated with Sauhardya Charitable Trust, which works toward providing food and education to under-privileged youth and children of rural Rajasthan.Lakshyaraj studied at Mayo College in Ajmer and graduated from the Blue Mountains International Hotel Management School in Australia. He completed a Professional Development Programme at Cornell Nanyang Institute of Hospitality Management in collaboration with Nanyang Technological University. He then completed his Bachelor of Commerce in Hospitality and Tourism from The University of New England. Academic Expert of NxG Committee, EDHEC Business School, NxG Committee, France. Along with a Ph.D. in Management Sciences from the University of Bordeaux, Rania Labaki holds the Family Firm Institute Certificates in Family Business and Family Wealth Advising. She is recipient of several international awards recognizing her contribution to research in the family business field. 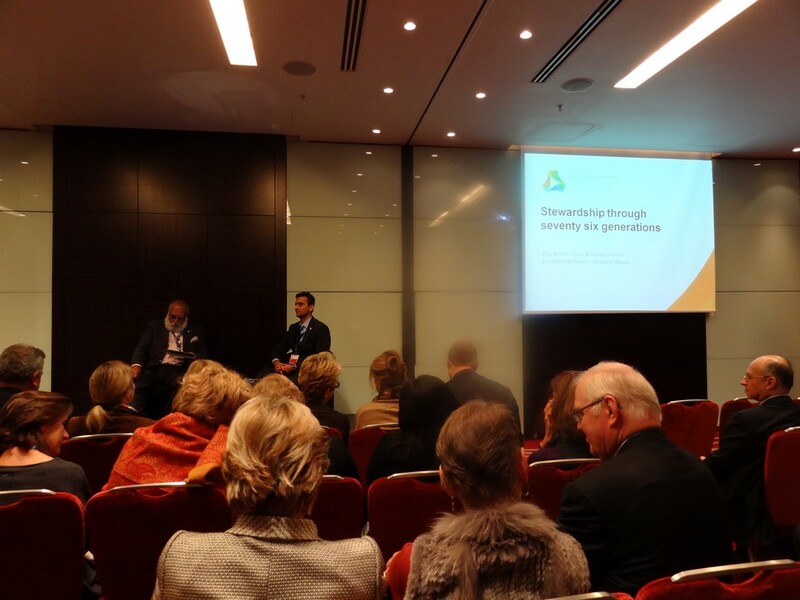 As a Next Generation member, you are continuously facing the challenge of 'growing' while balancing, connecting and exploring within, and without, the family business environment. The 'I' growth poses different challenges in this age of globalization and has different facets depending on the cultural context in which you are embedded. 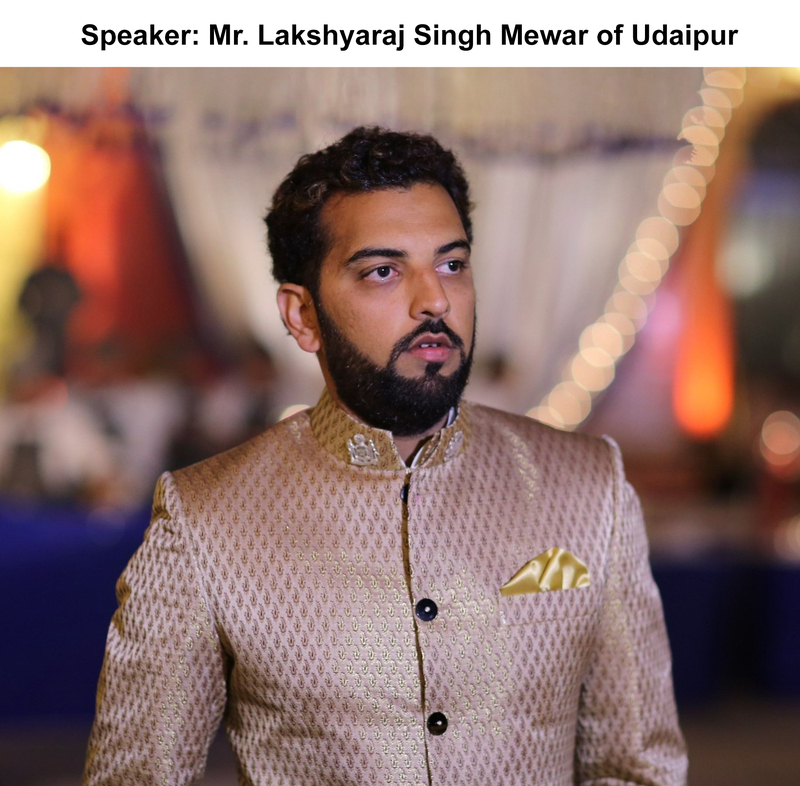 Lakshyaraj Singh Mewar will share with us his thoughts on making our 'I' Grow, by discussing its opportunities and its challenges. He will also guide us through his vision about the difference between 'Going through learnings' and 'Growing with Learnings', drawing upon his inspirations, experiences and knowledge as a member of the 76th generation of the Royal Family of Mewar. 1. Wednesday 1 June - Join Family Visits to get a unique grasp of Sweden's culture and the richness of it's family businesses. 2. 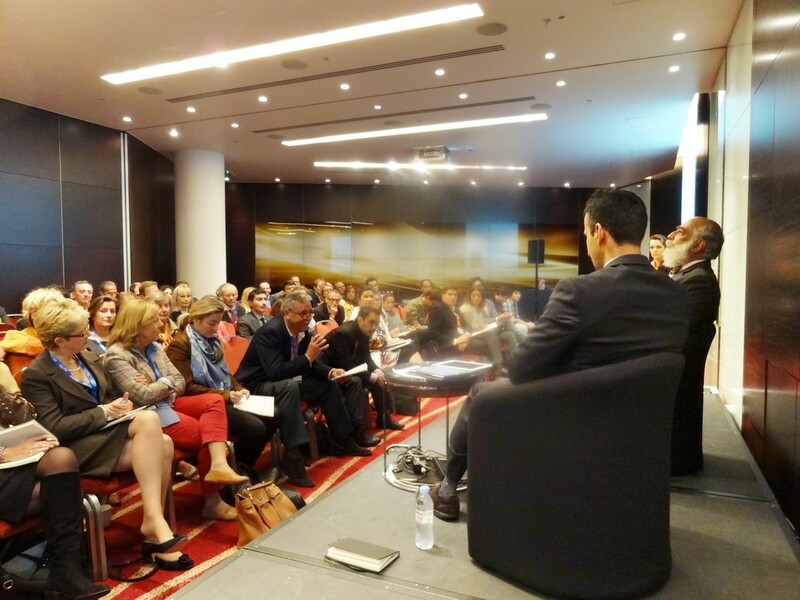 Thursday 2 and Friday 3 June - Engage in interactive small group discussions and experiential workshops, get inspired by first class keynote speakers, learn from family business cases from across the globe. 3. Experience Midsummer tradition and get out of your comfort zone during unique social events. 4. Friday 3 June, the summit will end at 16h00 and will be followed by an optional dinner for those wishing to enjoy more time together in Tallberg. The NxG Summit is a fantastic opportunity for you to meet your peers, share experiences, exchange ideas, explore new opportunities for yourself, your family, the business, the community and be inspired! 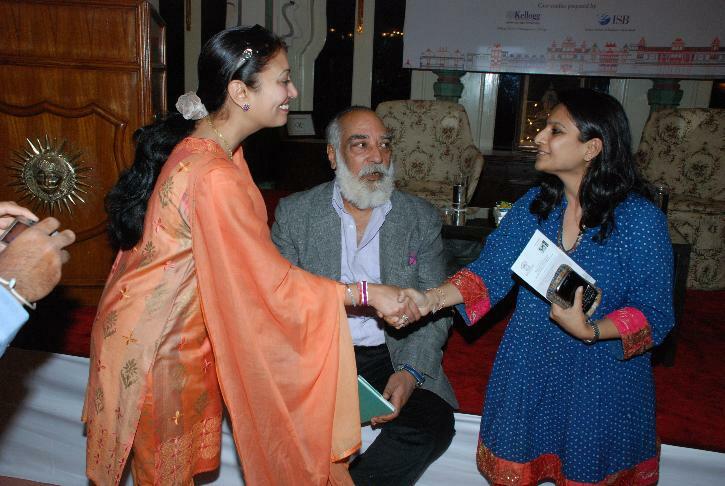 Maharana of Mewar Charitable Foundation (MMCF) and the CII-FBN India Chapter has developed a knowledge-sharing relationship over the years. The FBN focus on sharing best-practices of families resonates with the evolving needs of MMCF as a not-for-profit organisation working on developmental issues. MMCF today is one of the most respected not-for-profits organisation of Rajasthan. Professionalism at all levels; modern management and sustainable practices are other domains of interest for MMCF which the FBN network is able to satisfy. 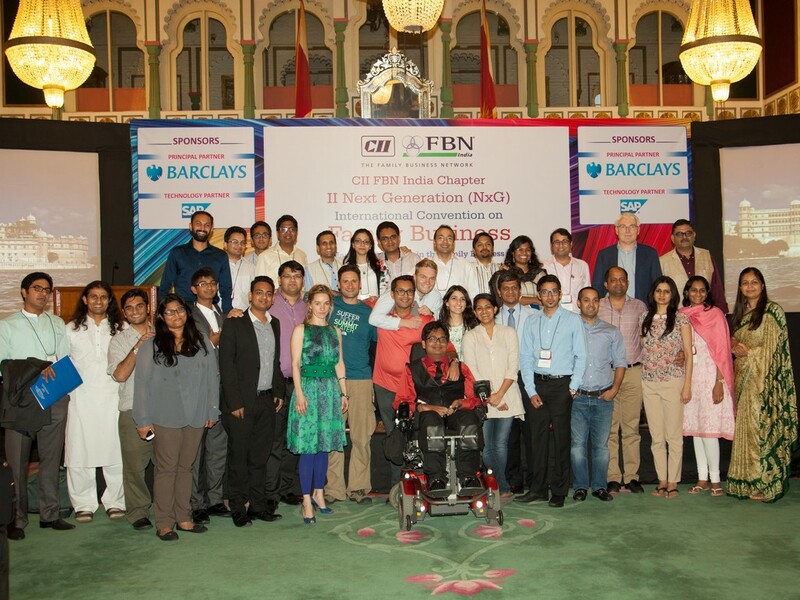 MMCF Trustees and senior functionaries have been actively participating in the FBN and FBN Next Generation programmes in India and overseas. They are able to interact meaningfully with other delegates and have confidently contributed to the proceedings. 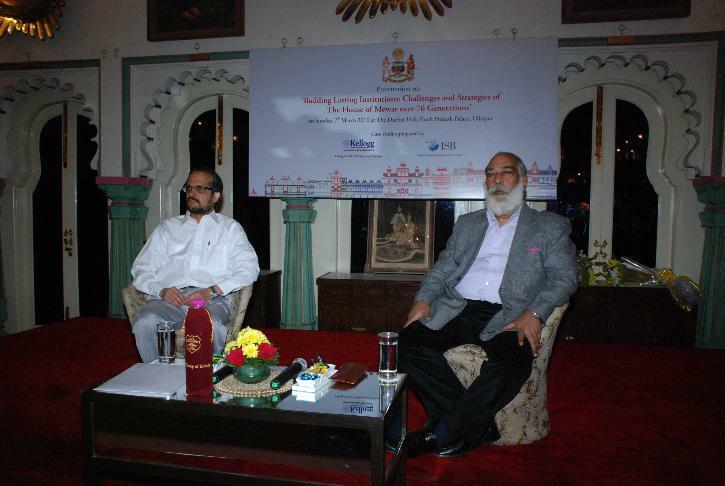 During the Goa convention in December 2015, the lead-faculty Ms. Amy Schumann utilized the presence of Mr. Lakshyaraj Singh Mewar of Udaipur (as Trustee of MMCF) to discuss the case study prepared on the House of Mewar by ISB-Kellogg's team of Prof. John L. Ward and Prof. K. Ramachandaran in 2010. 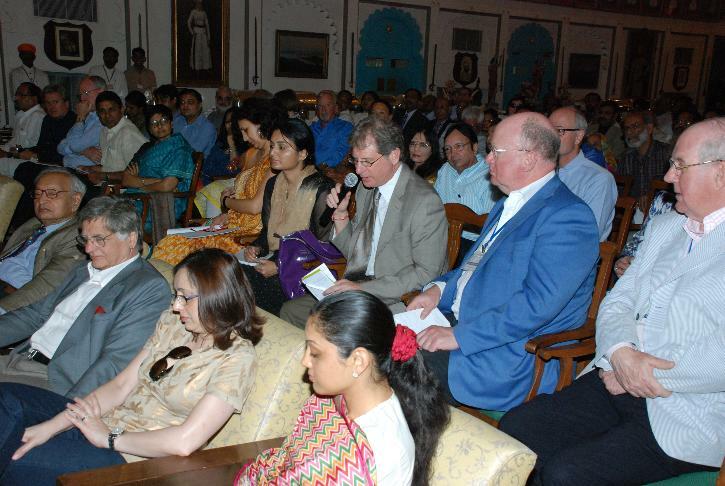 Issues of Custodianship and sustainability of the House of the Mewar were debated with intense audience participation. Through the MMCF, Udaipur participation, the FBN Nex Gen members have been made aware of the developmental works undertaken in Udaipur. Though most of the FBN members come from families with different background, they are able to relate to the challenges which MMCF is facing in a fast-globalizing world. focusing on Next Generation Leaders: Forging the Path to Excellence in HR Practices in Family Business 18 - 19 December 2015. 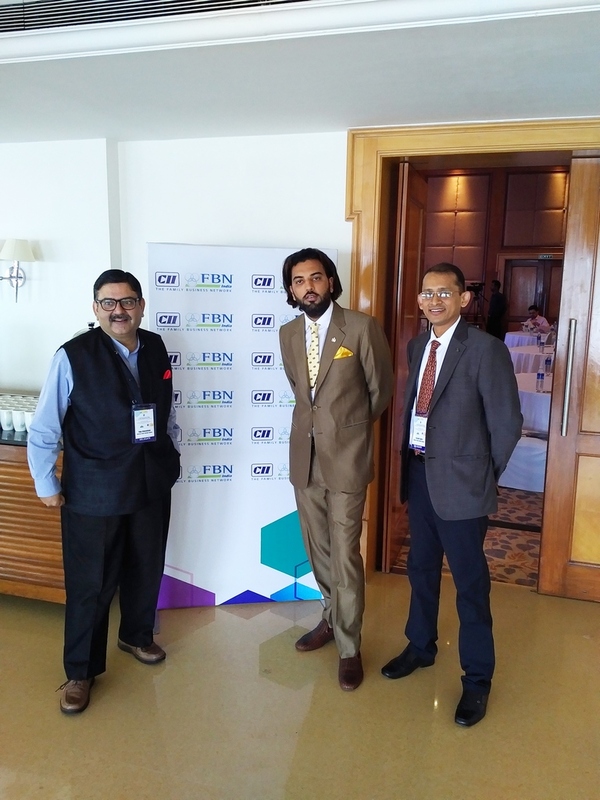 Mr. Lakshyaraj Singh Mewar of Udaipur, Trustee, Maharana of Mewar Charitable Foundation participated at the CII FBN India Chapter 3rd Next Generation International Convention held at Marriott Resort and Spa at Goa. The delegation from MMCF comprised of Dr. Mayank Gupta, Deputy Secretary - Development, and Mr Raju Mansukhani, media consultant. Ms. Amy M. Schuman, a principal Consultant of the Family Business Consulting Group, Inc. works with family business on leadership development, communication skills and team building. Amy was the founding facilitator of the Next Generation Leadership Institute, an intensive, two year program for next generation family business leaders that is part of the Loyola University Chicago Family Business Centre. Amy is the co-author with John L. Ward and Stacy Stutz of 'Family Business as Paradox'. She is the Co-author, with John L. Ward, of 'Family Education for Business Owning Families' and Co-author of 'A Woman’s Place…The Crucial Roles of Women in Family Business'. At the Goa convention, Amy explained how paradoxes were different from problems that could be solved or contradictions which can be resolved. Her focus was on developing the communication skills and faculties needed to resolve conflicts within the family business context. Group exercises drilled home these key messages. 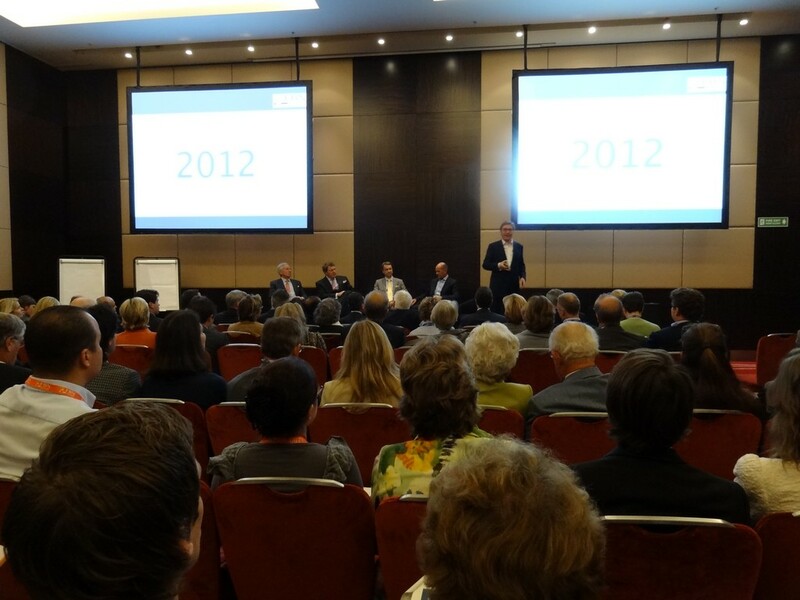 The convention saw the participation of young family business leaders in the 18-40 years age-group. 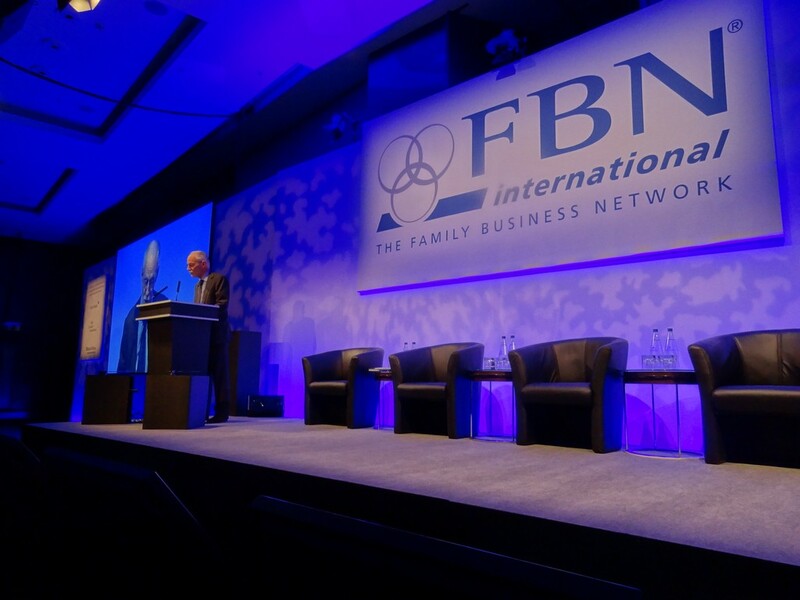 It provided a powerful platform to Next Generation Family Business leaders from across the country to discuss some of the most pressing issues concerning their role in Family Business and Commitment. 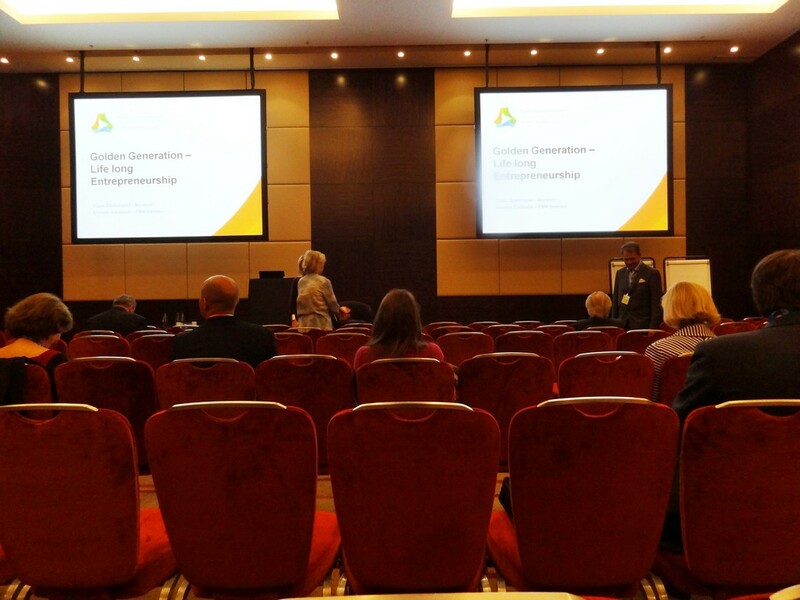 Attention was focused on diverse themes of interest with sessions focusing on Human Resources in Family Business: Learning Best Practices, then Choosing When and How to Apply Them. The day began with registration at Conference Board Room of Marriott Resort and Spa, Goa professionally organized by Ms. Pooja Jha, Deputy Director, CII FBN India Chapter, Confederation of Indian Industry, New Delhi. 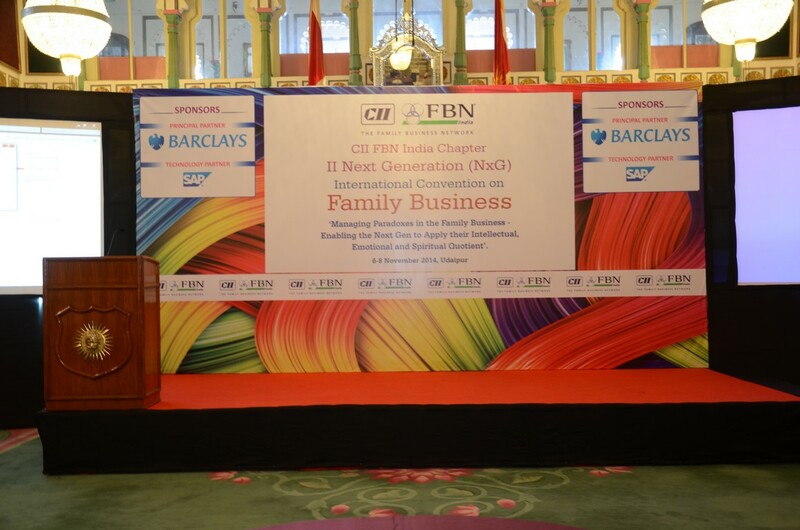 The 1st session was ‘Exemplary HR practices in Family Business and Family Business as Paradox’ and Opening Remarks were given by Mr. Ravi Shroff, Chairman, CII FBN India Chapter Next Gen committee and Vice President, Excel Industries, Mumbai. Mr. Arjun Chowgule, Member, Next Gen International Committee, FBN International, Immediate Past Chairman, CII FBN India Chapter Next Gen committee & Executive Director, Chowgule & Co Pvt Ltd, Goa gave an introduction to the two days programme and about the Faculty. He spoke about the FBN code of conduct and its internship programme. Ms. Amy Schuman started the session with introduction to Programme Outline and introduction of Participants with a concept of speed dating method. She referred to Prof. John Ward publication ‘Why Me Series’ which provides interesting insights into family business dynamics. Panel Discussions started with Mr. Arjun Chowgule, Mr. Ravi Shroff, Mr. Sandeep Chaudhary, Chief Executive Officer Consulting, Aon Hewitt India and Mr. Mridul Dhanuka, Co-Chairman, Next Gen Committee & Director Productions, Dhanuka Agritech Ltd, New Delhi and Ms. Amy Schuman as Moderator. The topic was 'Special Opportunities and Challenges of People Management in Family Enterprise: Stories from the Real World'. Another session was on Human Resources in the Family Business: Maximizing the Power of Your People by Ms. Schuman with an introduction to theme in plenary; Reflecting on your company’s HR roles and practices; Setting personal goals for the conference. Mr. Adrish Ghosh, Head of Wealth Advisory, India - Barclays Wealth and Investment Management, India and Mr. Raja Sanyal, Head of Marketing, Barclays Wealth and Investment Management, India presented their case on ‘Creating Value in Family Business’. Amy continued with her session on Exemplary Human Resources Practices in Family Firms: One Size Does Not Fit All and introduction to Family Business as Paradox and Application to HR followed by Mr. Anurag Aman, Director & Practice Leader, Family Led Business, Aon Hewitt India on Leapfrogging HR Sharing of lessons and research. The last session of the day concluded with Workshop: Application of paradox concepts in small groups by the Faculty. Mr. Lakshyaraj Singh Mewar had a luncheon meeting with Mr. Ravi Shroff, Chairman, CII-FBN India Chapter and he discussed about enhanced participation of FBN India Chapter at FBN International Conventions. The CII FBN India Chapter invited him for more participation in the executive councils besides other workshops and conventions. The 2nd day was themed around ‘Creating Vibrant Corporate Culture and Communications, Summary and Application’. The morning session started with opening remarks and Summary of Proceedings, gathering input from group by Ms. Amy Schuman. This was followed by an activity on Culture and Communications. Amy explained about Nurturing Exemplary Corporate Culture and Communications with several notes including ‘How does culture differ in family firms?’, ‘How can HR help leverage culture as a competitive advantage?’and ‘What role can the next generation leaders play?’ Examples of exemplary family business cultures – how do they get there? ; Family First and Business First cultures (through the Prof John Ward assessment tool) – what are strengths and weaknesses of each approach? Which are you? ; Workshop: Identify your corporate culture, its strengths and vulnerabilities. An International Case study “Where is the Love or the lack of it? Dealing with Dysfunctional Family Dynamics” was presented by Mr. Daniel Aponte Prypchan, Chief Financial Officer, Producer and Certified Practising Accountant (CPA) followed by Indian Case Study by Ms. Radhika Gopal Krishan, Partner Leadership, Aon Hewitt Consulting moderated by Mr. Mridul Dhanuka. Closing remarks were given by Ms. Amy Schuman. 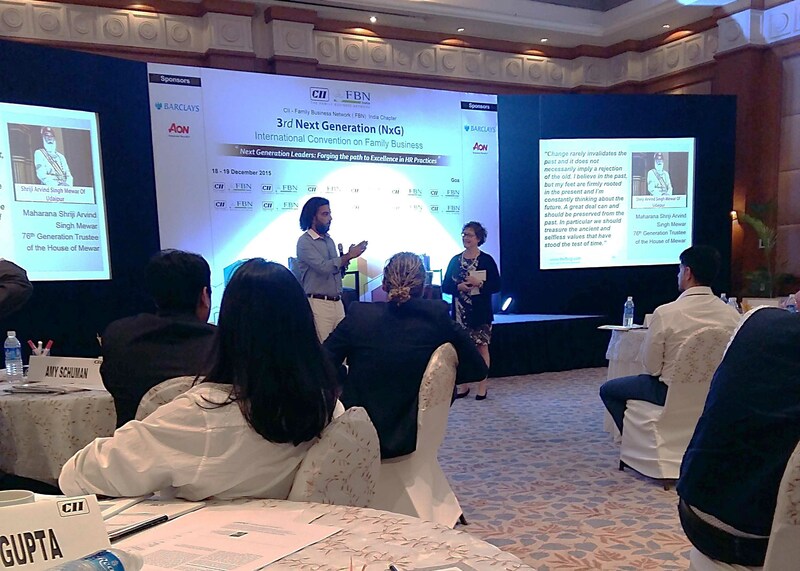 In the concluding session, she used the House of Mewar case study and Shriji Arvind Singh Mewar’s quote on 'tradition and change' to drive home the point. 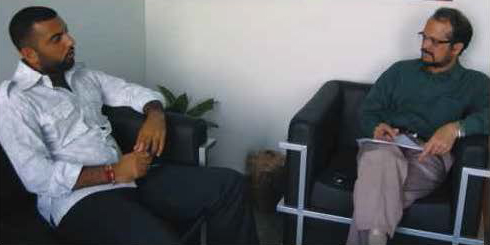 With Mr. Lakshyaraj Singh Mewar’s presence, she utilized the opportunity to get him to explain the paradox across generations, and the responsibilities he has to shoulder. 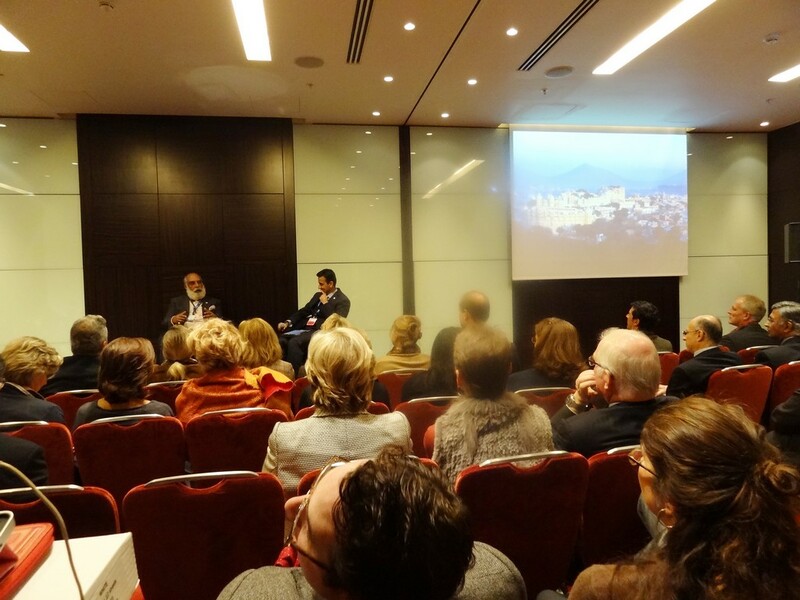 The Q&A that followed was also very intense; He explained the historical context and the challenges of 'being in the Now'. A gala dinner at the North Lawns of the Hotel brought to an end the two-day Convention, with thumping music, dance and delicious cuisine under the night skies of Goa Marriott. Professionalism at all levels, modern management and sustainable practices are other domains of interest for MMCF which the FBN network is able to satisfy. MMCF Trustees and senior functionaries have been actively participating in the FBN and FBN Next Generation programmes in India and overseas. 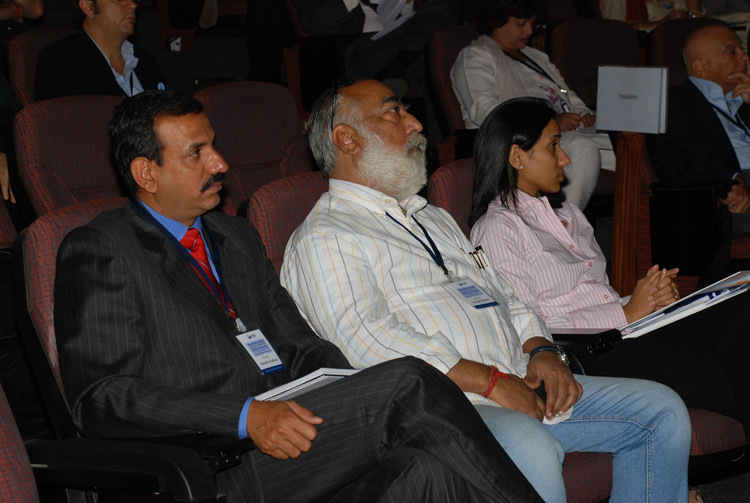 They are able to interact meaningfully with other delegates and have confidently contributed to the proceedings. 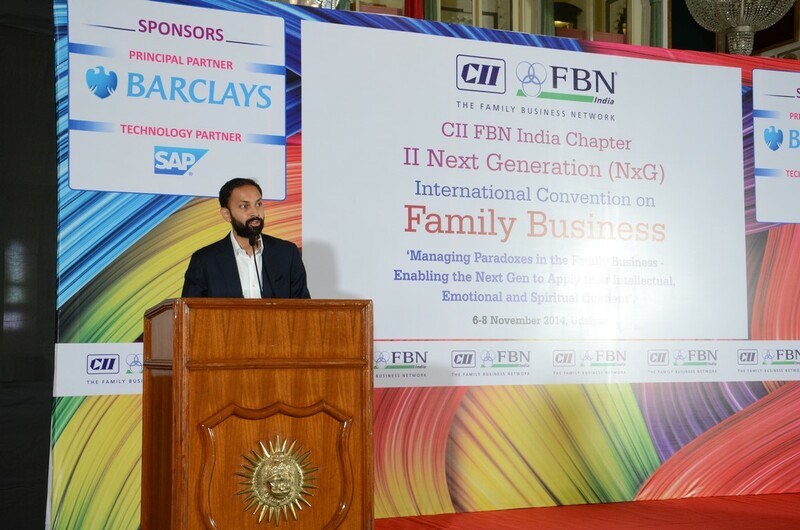 Mr. Lakshyaraj Singh Mewar of Udaipur, Trustee, Maharana of Mewar Charitable Foundation was the gracious host of the CII – FBN II Next Generation (NXG) International Convention 2014. 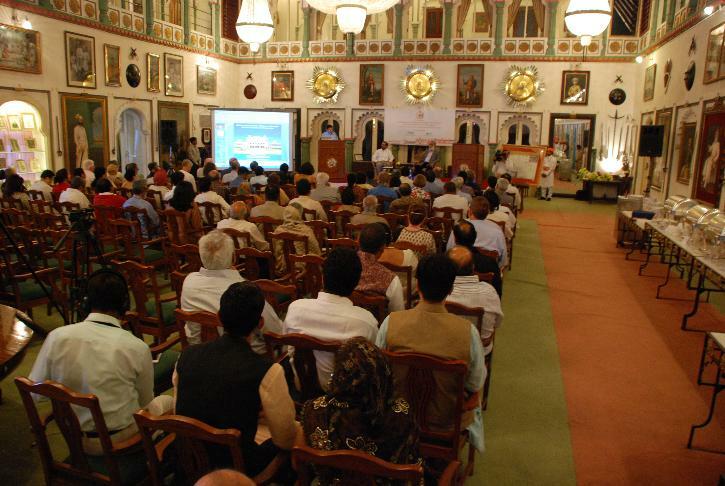 The convention was held at Sabhagaar Conference Hall, The Durbar Hall, Fateh Prakash Palace Convention Centre, The City Palace, Udaipur from 6th November to 8th November 2014. The theme of the event was ‘Managing Paradoxes in the Family Business – enabling the Next Gen to apply their Intellectual, Emotional and Spiritual Quotient’. Lead Faculty of the Convention was Mr. Albert Jan Thomassen, from Netherlands, a specialist on governance and succession issues of enterprising families. He conducted the key sessions over the two days. 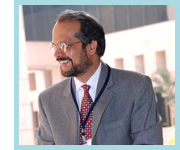 Mr. Jan regularly moderates and facilitates workshops, education programmes and family meetings. Apart from his work for FBNed he is also a moderator for the recently launched New Leaders Circle by FBN’s Next Generation Committee as well as member of the management committee of European Family Businesses. 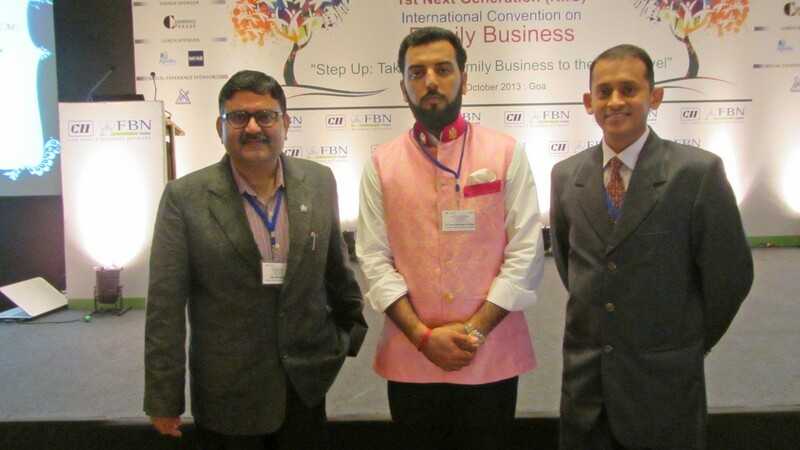 The international convention, organised by the India chapter, drew participation of young family business leaders from the age bracket of 18-40. 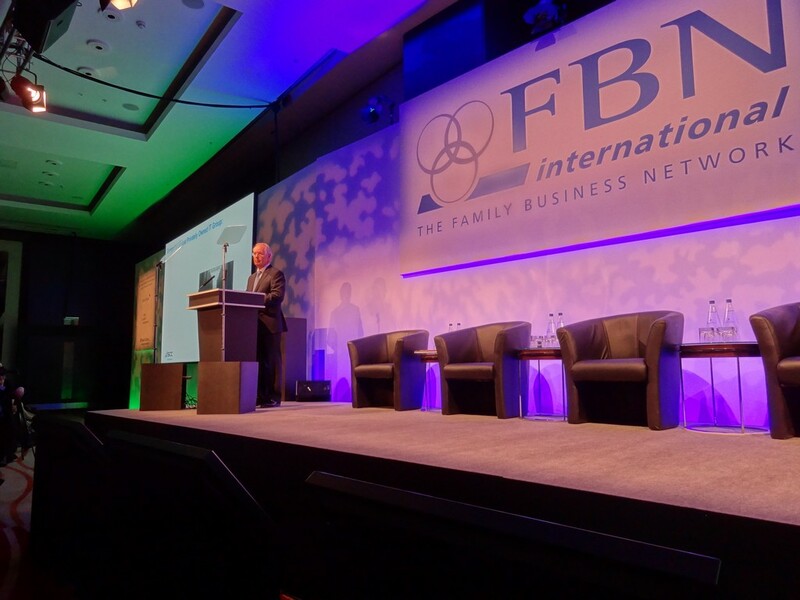 The convention provided a powerful platform to Next Generation Family Business leaders from across the country to discuss some of the most pressing issues concerning their role in Family Business. 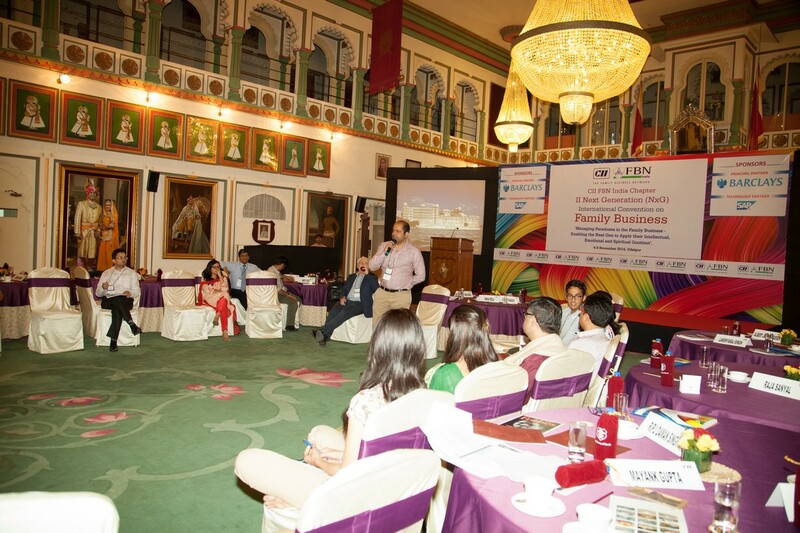 Attention was focussed on diverse themes of interest to young business leaders, with sessions focusing on Governance and Succession, Leadership focusing management, Innovation, Marketing, and Spirituality in Family Business etc. There were panel discussions on topics like ‘Entrepreneurship within the Family Business’ and “Women and Emotions in the Family Business’. The 1st day began with the registration at Sabhagaar Conference Hall, The Durbar Hall, Fateh Prakash Palace Convention Centre, The City Palace, Udaipur organized by Ms. Pooja Jha, Deputy Director, Confederation of Indian Industry, New Delhi. 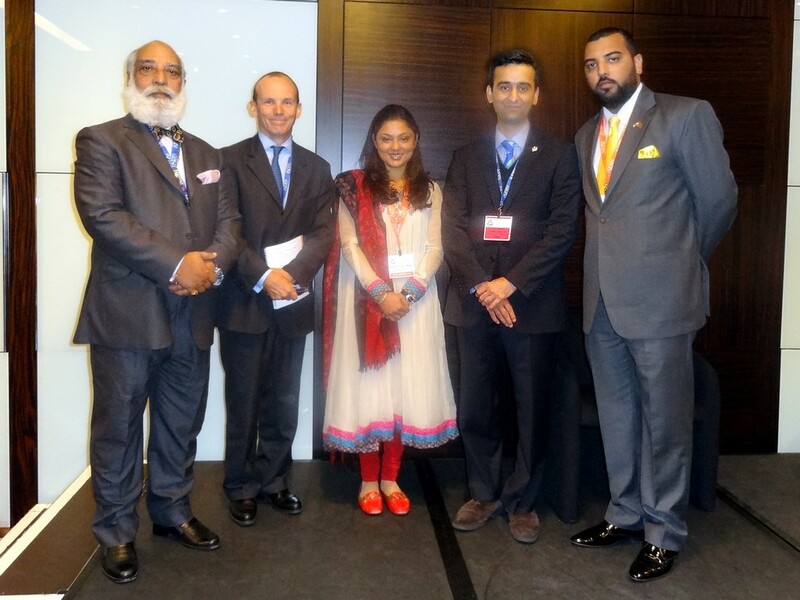 Mr. Lakshyaraj Singh Mewar of Udaipur, Trustee, Maharana of Mewar Charitable Foundation along with Ms. Vrinda Raje Singh, CEO – JCI; Mr. Raju Mansukhani, Consultant, Media and Communications, MMCF and Dr. Mayank Gupta, Deputy Secretary MMCF - Development registered as MMCF delegates. 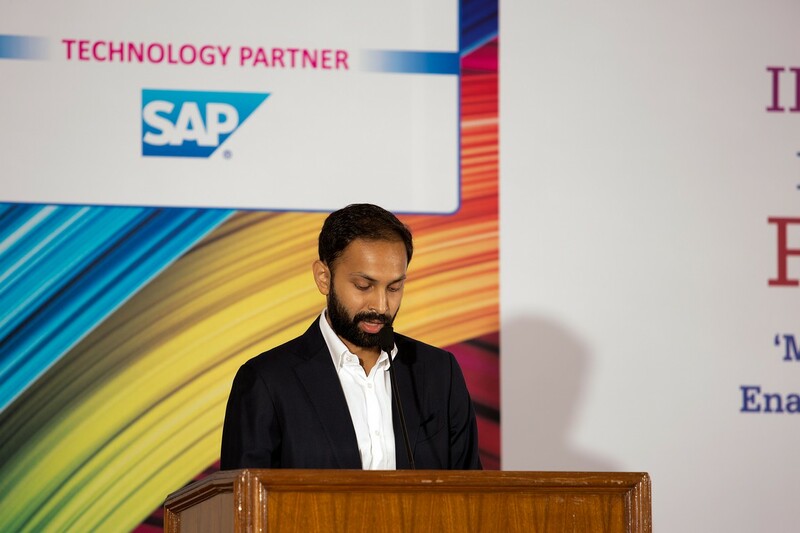 They coordinated meetings with young business leaders like Mr. Arjun Chowgule, Chowgule Group of Companies; Mr. Gaurav Ghatge, ED, Ghatge Logistics and Dr. Rania Labaki Facilitator; and the Team from SAP. In the evening the delegation experienced the Kartik Poornima Celebration 2014 where the renowned Kathak danseuse Ms. Uma Sharma and her troupe performed at Jagmandir in the light of the full moon. The 2nd day’s morning session started with the opening remarks of Mr. Arjun Chowgule, Chairman – NextGen, CII FBN India Chapter. Followed by a special address by Mr. Lakshyaraj Singh Mewar of Udaipur, Trustee, Maharana of Mewar Charitable Foundation. Dr. Albert Jan Thomassen, Executive Director, FBN Netherlands (FBNed) devoted the first of his sessions to enumerating the paradoxes in the personal and professional lives of the Next Generation. Brief exercises and interactions made for a lively session. In the 2nd session the International case study was presented by Mr. Petri Tuomela, Founder - me2we Finland Ltd. The case study was moderated by Dr. Albert Jan Thomassen. 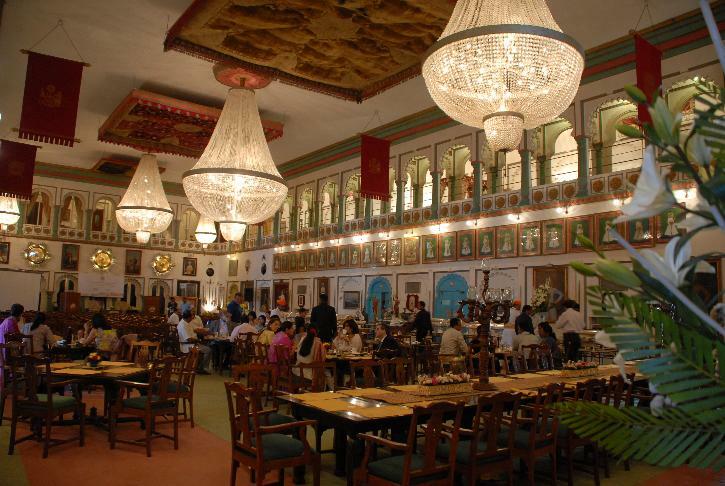 Lunch was held at Satkaar Banquet Hall, Fateh Prakash Palace, The City Palace, Udaipur. The post-lunch Session was a panel discussion focusing on Entrepreneurial Family. It was moderated by Mr. Gaurav Ghatge, Committee Member, CII FBN India Chapter Next Gen Committee and Executive Director of Ghatge Logistics Pvt. Ltd., Pune. Panellists were Mr. Ravi Shroff, Executive Director, Excel Industries Ltd.; Mr. Rishabh Shroff, Principal Associate, Amarchand & Mangaldas & Suresh A. Shroff & Co. and Mr. Ajmal M Habeeb, Managing Director, Unity Care & Health Services Pvt Limited. 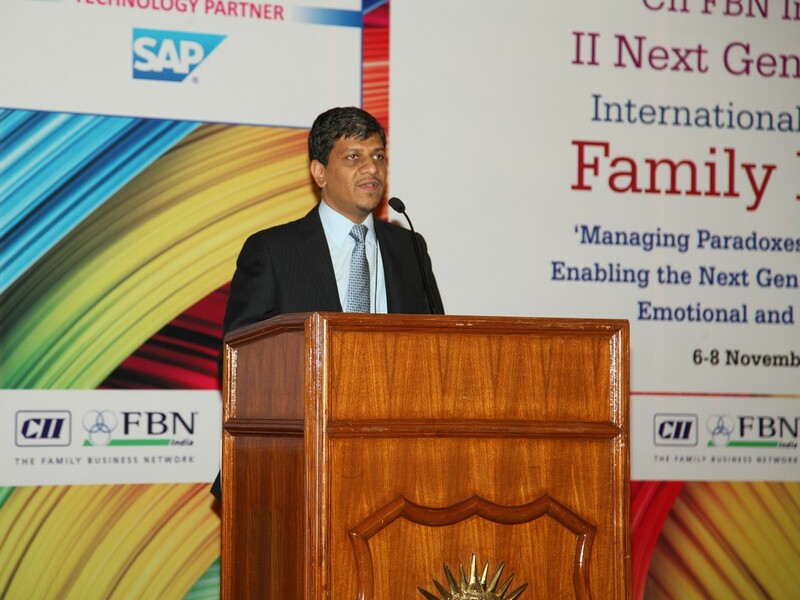 It was followed by a presentation of Mr. Subhomoy Sengupta, Vice President, General Business, SAP India Pvt. Ltd. The session on Leadership and Innovation was conducted by Mr. Bhawani Singh Shekhawat, management consultant from Bangalore. Dr. Albert Jan Thomassen concluded the day with his closing remarks. 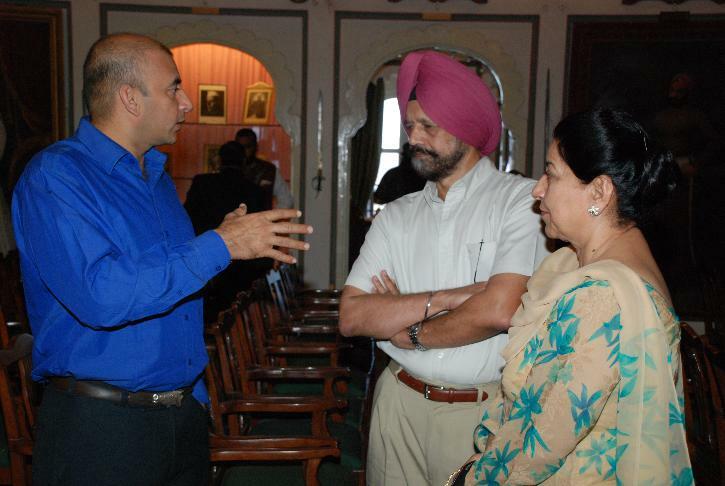 A visit to ‘The Innovation Express’ was organized by SAP at The Promenade, The City Palace, Udaipur. The 3rd day began with the opening remarks and summary of proceedings of Day 2 by Mr. Ritum Jain, Committee Member, II FBN India Chapter Next Gen Committee and CEO, Safechem Industries. 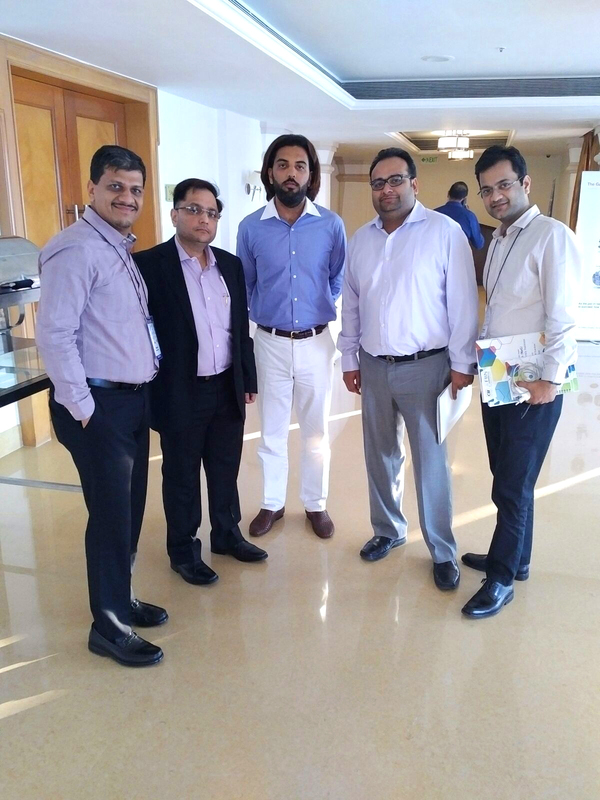 Barclays Wealth and Investment Management shared their insights on ‘Next Gen – redefining the Family Business Dynamics’ with presentations by Mr. Satya Bansal, Chief Executive Barclays Wealth & Investment Management, India. 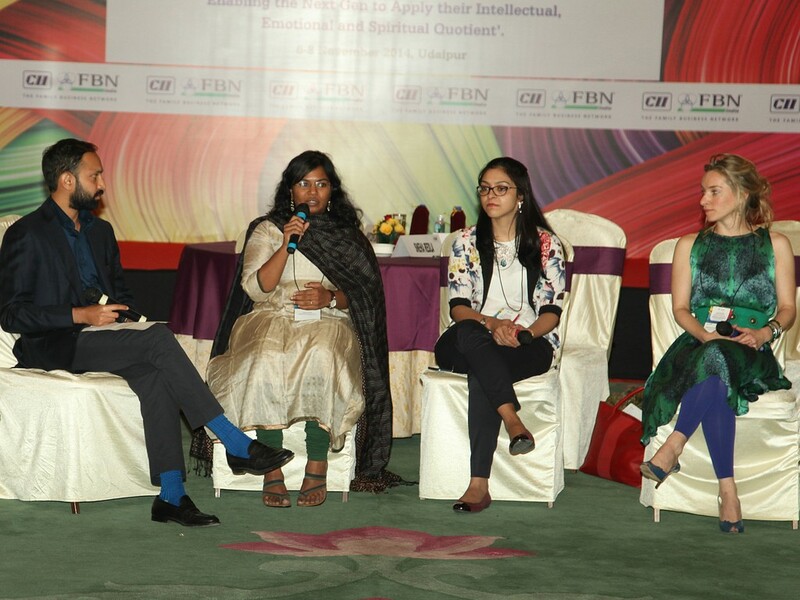 After lunch, there was the Panel Discussion on ‘Women – the Shakti of Family Business’. It was moderated by Mr. Arjun Chowgule and the panel members were Ms. Caroline Lubbers, Entrepreneur and chocolate connoisseur, Fine Flavour Chocolate; Mrs. Shohini Mukherjee, Director, SSP Pvt. Ltd. and Ms. Sneha Redla, Assistant Manager, Aarvee Associates Architects Engineers & Consultants Pvt. Ltd. The session on ‘Spirituality for Next Gen’ held by Mr. Dinesh Ghodke, Faculty, Art of Living & Director Outreach, Sri Sri University (SSU). Dr. Albert Jan Thomassen final session and closing remarks brought into perspective the IQ, EQ and SQ facets discussed over the two days. Mr. Gaurav Ghatge presented the vote of thanks and hoped that the next convention would be as inspiring. 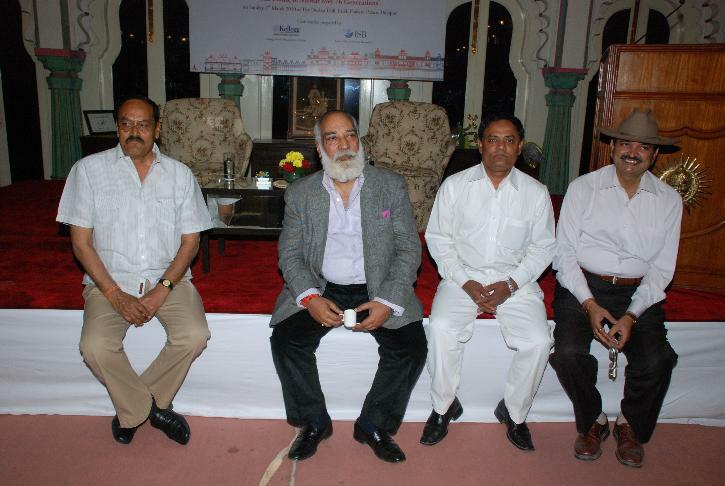 A gala dinner at the Jagmandir Island Palace, Udaipur brought to an end the three-day Convention. Voicing opinions on the International stage 24 – 26 October 2013. 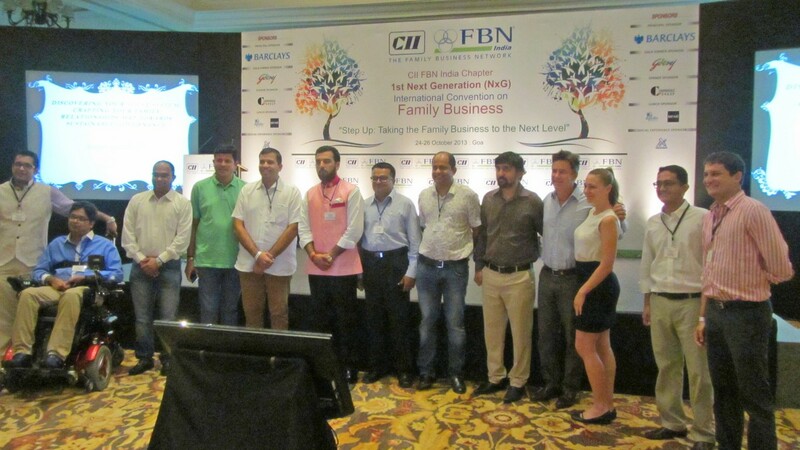 An annual event for Next Generation members of Family Businesses, the International convention, the first of its kind being organised by the Chapter, had drawn the participation of young family business leaders in the age group of 18-40 years. 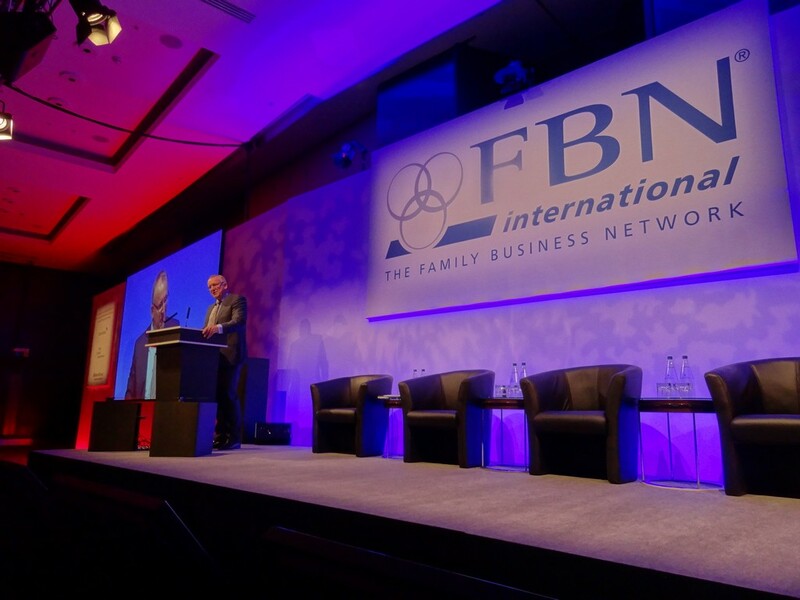 The convention provided a powerful platform to Next Generation Family Business leaders across the country and the globe to share and gain from insightful discussions. The three-day event directed attention on diverse themes of interest to young business leaders, such as social media, viral marketing and brand building. There were panel discussions on topics like 'New Leaders - Building Credibility & Trust in the Family Business' and 'Outside Work Experience vs Joining Family Business Directly'. 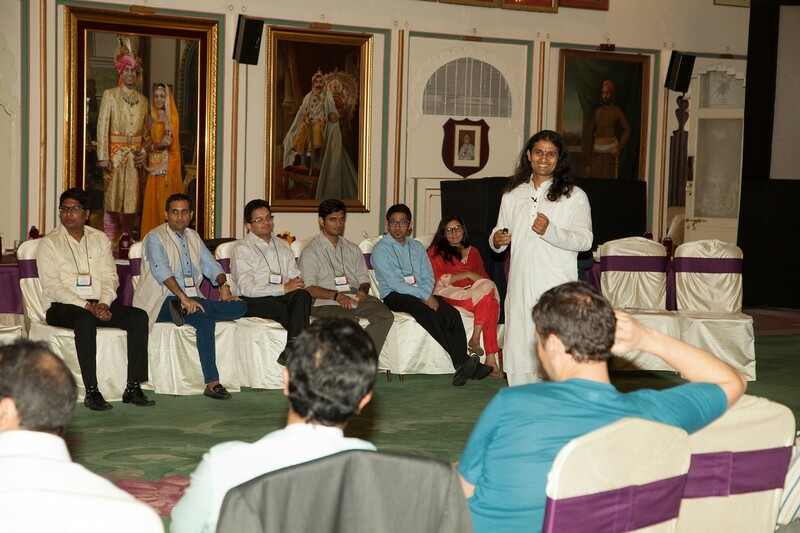 Besides, participants were introduced to the 'New Leaders Circle'. The day began with the registration at the lobby of the venue followed by dinner and ice-breaking session at the grounds of Parvatibai Chowgule College of Arts and Science, Margao, Goa hosted by Chowgule Family. 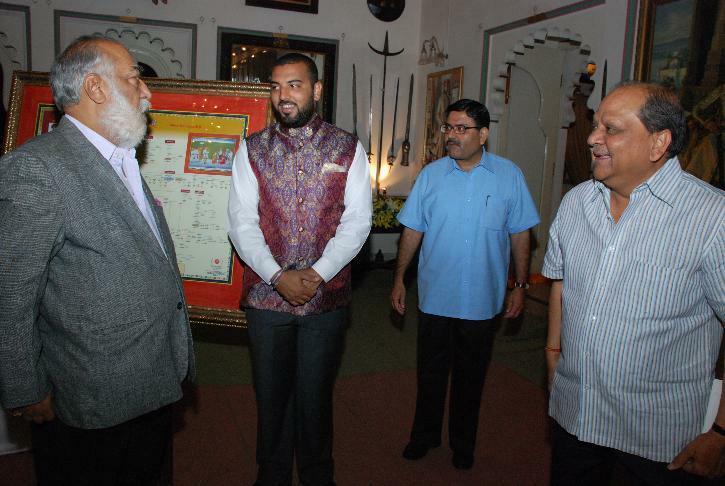 Mr. Lakshyaraj Singh Mewar, Trustee, Maharana of Mewar Charitable Foundation along with Mr. Raju Mansukhani, Consultant, Media and Communications, MMCF and Dr. Mayank Gupta, Deputy Secretary MMCF, Development registered from MMCF, Udaipur held meetings with several young business leaders like Mr. Arjun Chowgule, Chowgule Group of Companies; Mr. Gaurav Ghatge, MD, Ghatge Logistics and Mr. Shankar Vanavarayar, Executive Director, Sakthi Auto Motors Ltd. Over a barbeque, out in the premises of the Chowgule Group offices, the evening was a memorable one. The morning session started at The Banquet Hall of Taj Exotica with the opening remarks of Mr. R. Haresh, Chairman, CII FBN India Chapter Core Group and Managing Director, TVS, followed by address from Mr. Arjun Chowgule, Leader, CII FBN India Chapter Next Gen Initiative & General Manager, Chowgule & Co. Pvt. Ltd., Goa. In the 2nd session the International case study was presented by Mr. Ulrich Schmidt-Maybach, Fourth Generation of Maybach Family & Founder, Wilhelm and Karl Maybach Foundation, USA. The case study was moderated by Dr. Rania Labaki, Associate Professor of Management, Family Business Research Centre University of Bordeaux, France. The Lunch session commenced with a panel discussion focusing on New Leaders - Building Credibility & Trust in the Family Business and the panel moderated by Mr. Gaurav Ghatge, Chairman CII Western Region, Family Business Sub Committees and Managing Director, Ghatge Logistics. Amongst the panel members were Mr. Shankar Vanavarayar, Co – Chairman, Family Business Sub Committee & Executive Director, Sakthi Auto Motors Ltd., Mr. Risto Väyrynen, Finland, Mr. Tamas Kurti, Hungary and Ms. Bhairvi Jani, Director, SCA Group of Companies. 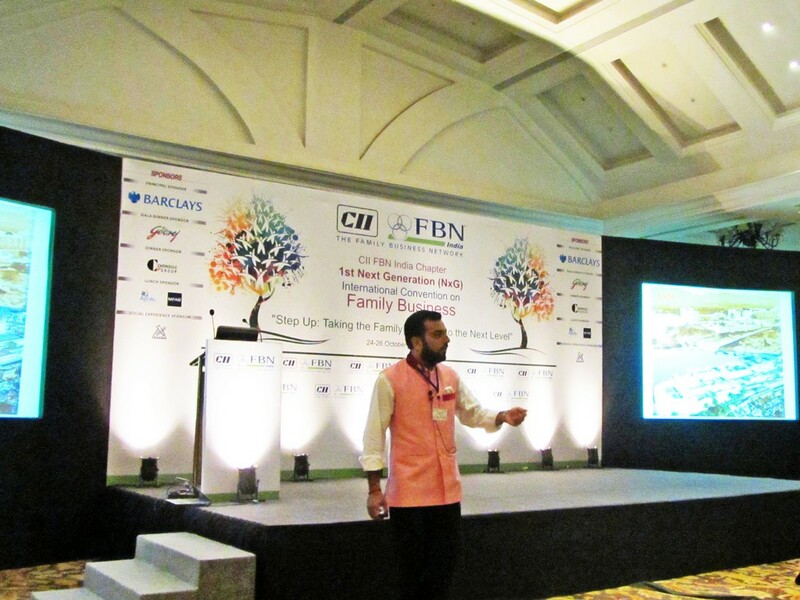 The next session of the day was centred on 'Getting to Higher Ground : How NxGs can leverage the family emotions? 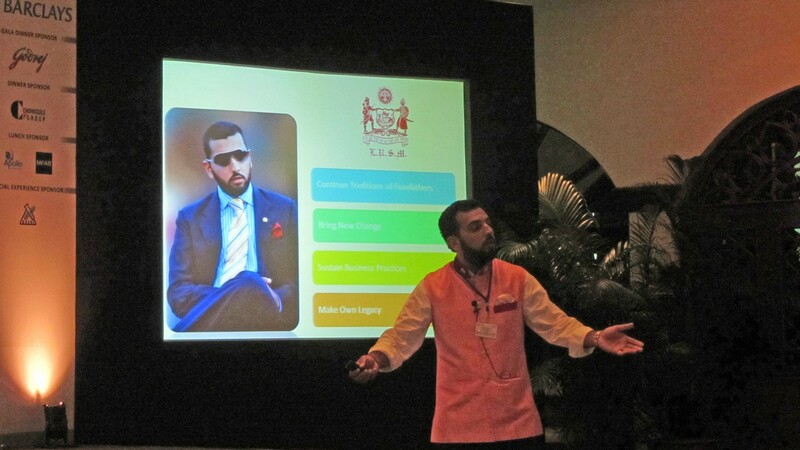 ', by Dr. Rania Labaki and lastly on Brand New Generation by Mr. Sid Shah, Brand strategist and motivational speaker. The morning session social event began with the opening remarks and summary of proceedings of Day 1 and 2 by Mr. Arjun Chowgule and was followed by the Indian Case Study from Mr. Lakshyaraj Singh Mewar. 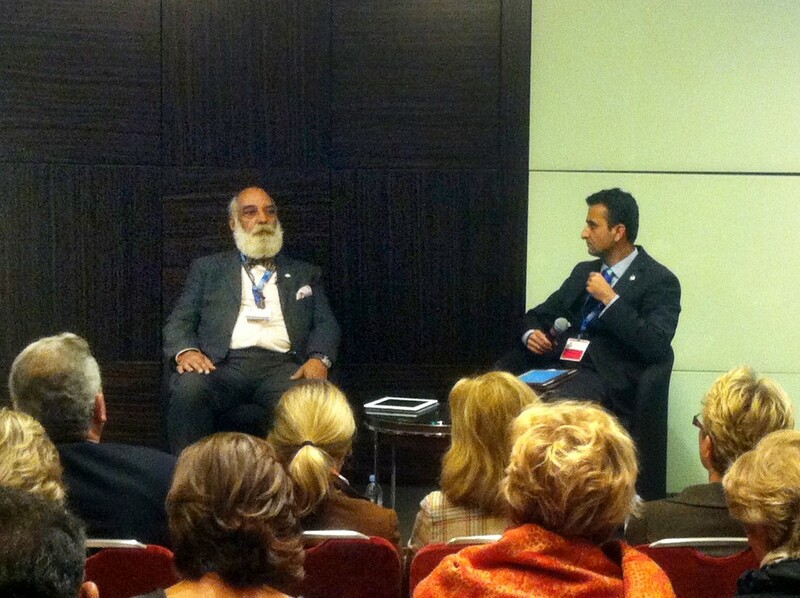 Mr Mewar delivered an inspiring talk focusing on 'Step Up: Taking the Family Business to the Next Level'. His first plea to the audience was to 'break the stereotypes' and 'get out of the trap' that age, education and technology may be pushing us into. "If we remain trapped, we will not be able to think freely, independently; we do not need to think out-of-the-box, we only need to get rid of the box itself," he said, with characteristic panache, holding the audience spell-bound. Knowledge, he said, is more important than education; learning from all quarters is the stepping stone to achieving a sense of fulfilment is more important than success. He drew from his own experiences in India and Australia and highlighted how learning is a continuous process and cannot be assessed by educational degrees or examination marks. 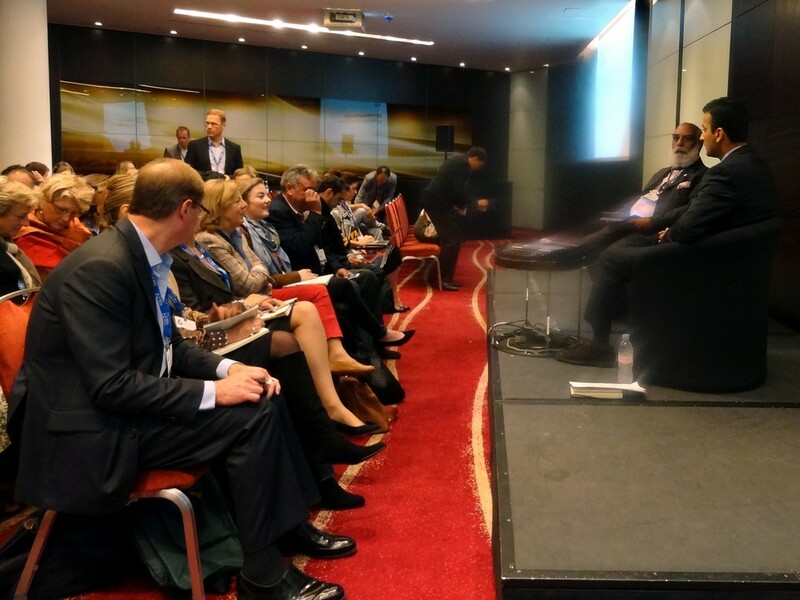 Industry giants like Barclays Wealth and Investment Management shared insights. The lunch session was started with the topic 'Co-preneurship: Getting entrepreneurial…' by Laura Horstmann & Dr. Ingo Stork-Wersborg, Presibake, followed by a motivational concluding session on 'Auto Pilot Thinking' by Mr. R. Sridhar, Innovation and Coach partner, IDEAS-RS. The evening session was more of a summary and closing remarks and a thank you note by Dr. Rania Labaki and Mr. Arjun Chowgule. The convention concluded with a gala dinner at Hotel Radisson.Mr. 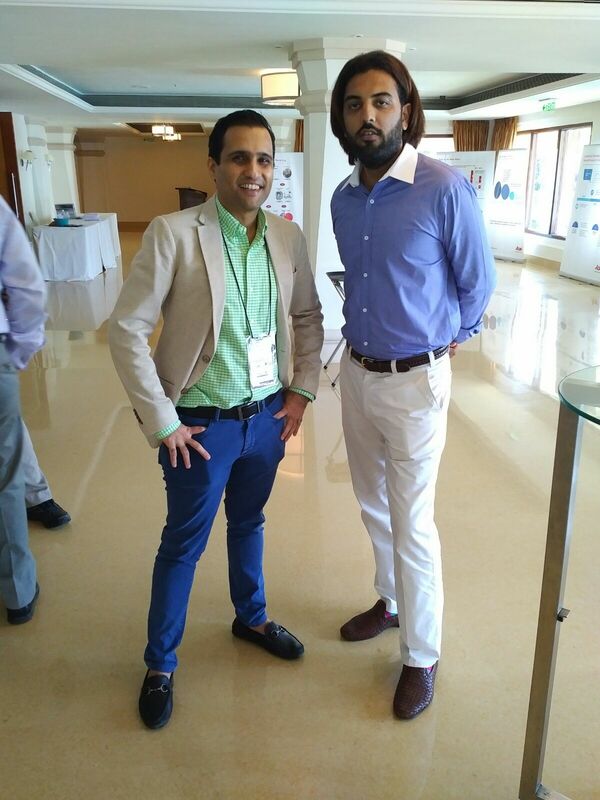 Lakshyaraj Singh Mewar had a luncheon meeting with Mr. Arjun Chowgule and, on the CII-FBN India Chapter request, he invited them to visit Udaipur and plan for hosting the 2nd Next Gen International Convention scheduled to be held in November 2014 in the 'City of Lakes'! Shriji, Ms. Padmaja Kumari Mewar and Mr. Lakshyaraj Singh Mewar of Udaipur attended the welcome reception on October 3, 2013 of the Business Network 23rd International Summit, London October 2012 (FBNI) held at the National Portrait Gallery. 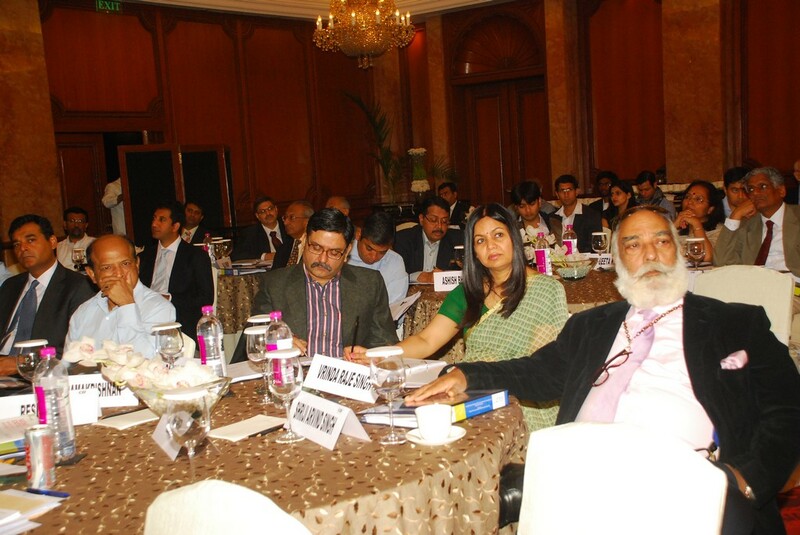 Shriji, Ms. Padmaja Kumari Mewar and Mr. Lakshyaraj Singh Mewar of Udaipur attended the opening programme on Octobner 4, 2012 of the FBNI Seminar at the Park Plaza Hotel, Westminster Bridge, SW1. The session started with talks by Mr. Thierry Lombard, Managing Partner of Lombard Odier, Darier Hentsch and Cie, Mr. Ross Warburton, Chairman, Warburton Bakeries. Keynote speakers Lord Green, Sir Peter Rigby and Mr. George Kohlrieser. 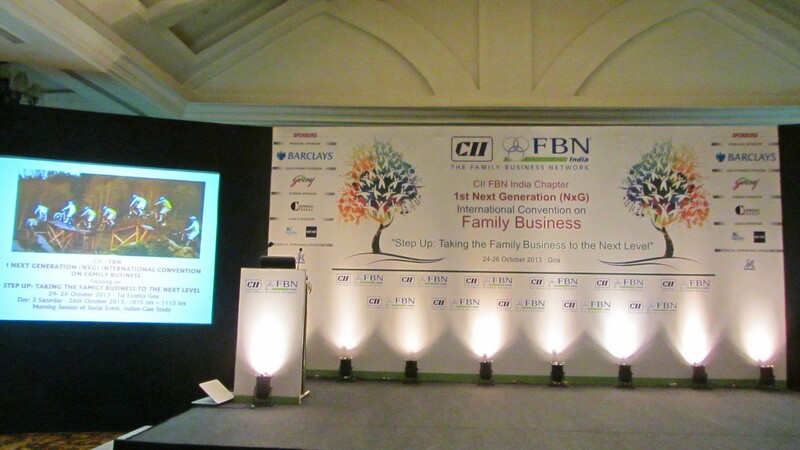 Shriji attended a two day XIV CII-FBN International Annual Convention on Family Business focusing on 'Best Practices and Beyond Best Practices' held at Taj Mahal Hotel, New Delhi on March 15, 2012. 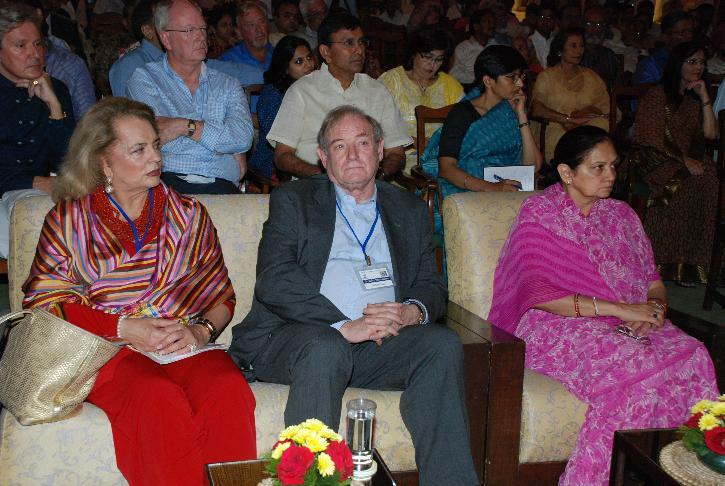 Dr. John Ward, Professor, The Kellogg School of Management, USA was the lead faculty for the convention. 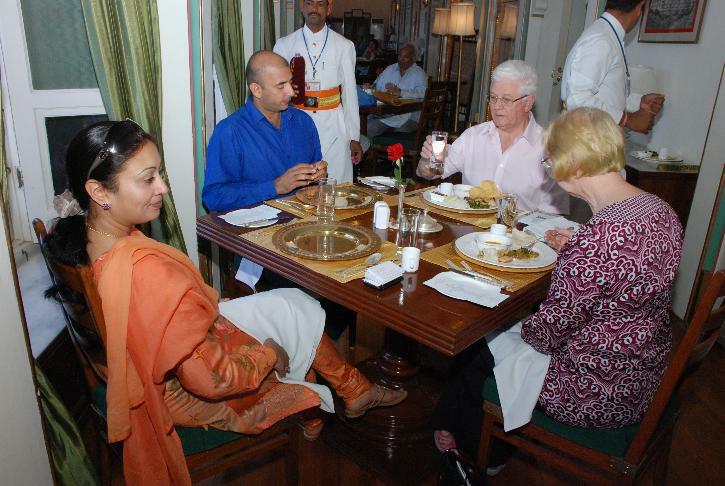 Shriji was accompanied by Ms. Vrinda Raje Singh, CEO, Joint Custodianship Initiatives, Maharana of Mewar Charitable Founation, Udaipur and Mr. Raju Mansukhani, Communication Consultant - Maharana of Mewar Charitable Foundation, Udaipur. 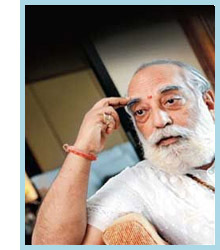 "I believe in the past, with my feet in the present, and my mind in the future," wrote Shriji Arvind Singh Mewar in the Preface to the vision-document titled, 'Inheritance 76', in February 1996. Shriji has always maintained that "change rarely invalidates the past, and it does not necessarily imply a rejection of the old." 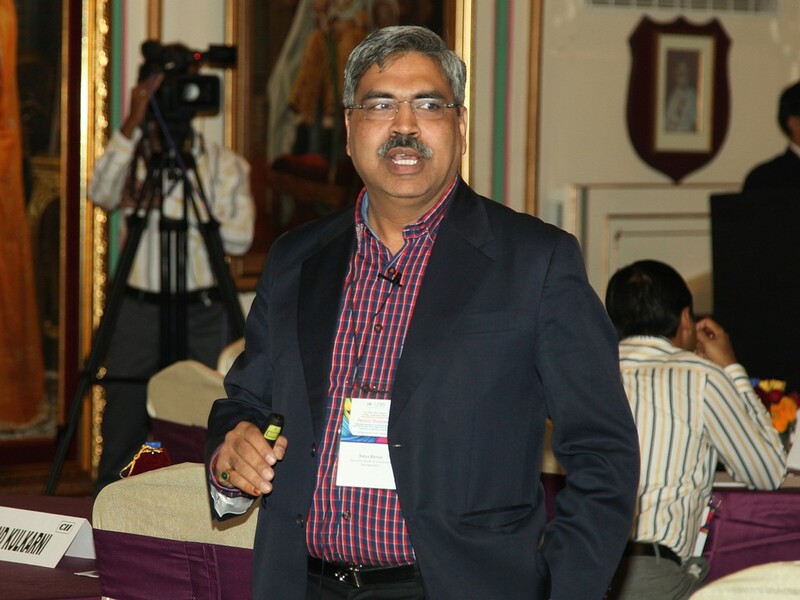 Alive to the challenges of the future, Shriji has been attending Family Business conferences and workshops in Hyderabad and New Delhi. He is keenly aware that new ideas in family business governance need to be incorporated into maintaining, sustaining and enhancing the office of Custodianship in the House of Mewar, Udaipur. 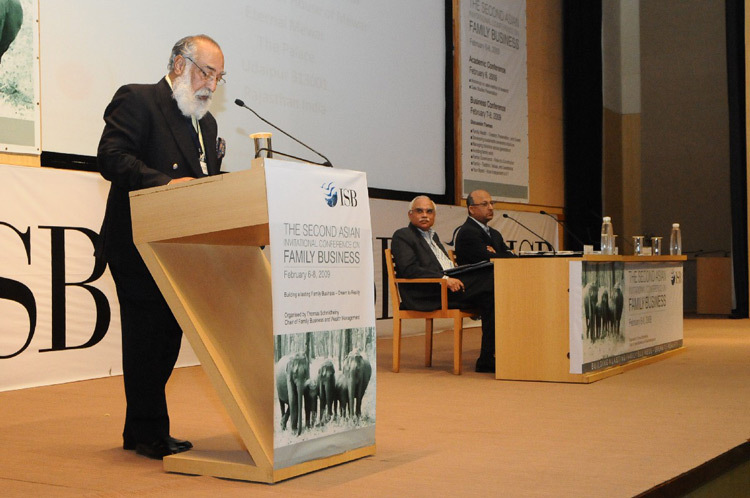 Marking a new beginning, the House of Mewar will be represented at the London Family Business Network (FBN) Summit, from October 4th to 6th, 2012 by Shriji Arvind Singh Mewar. 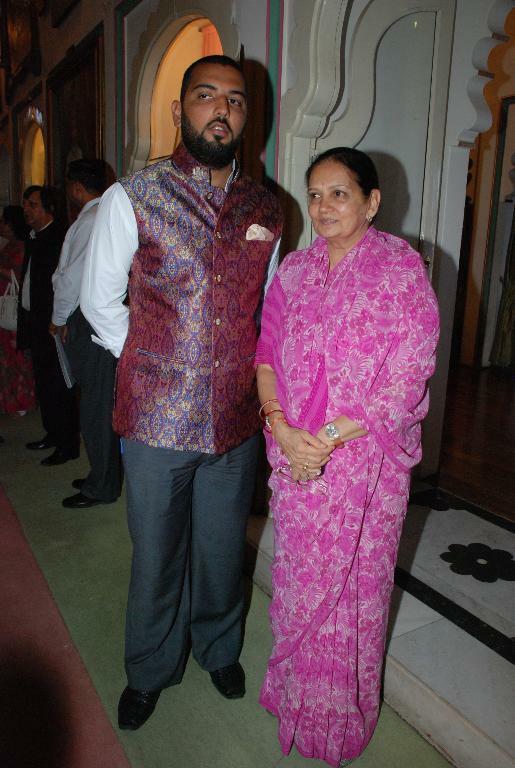 The next generation will be represented by Ms Padmaja Kumari Mewar and Mr Lakshyaraj Singh Mewar. 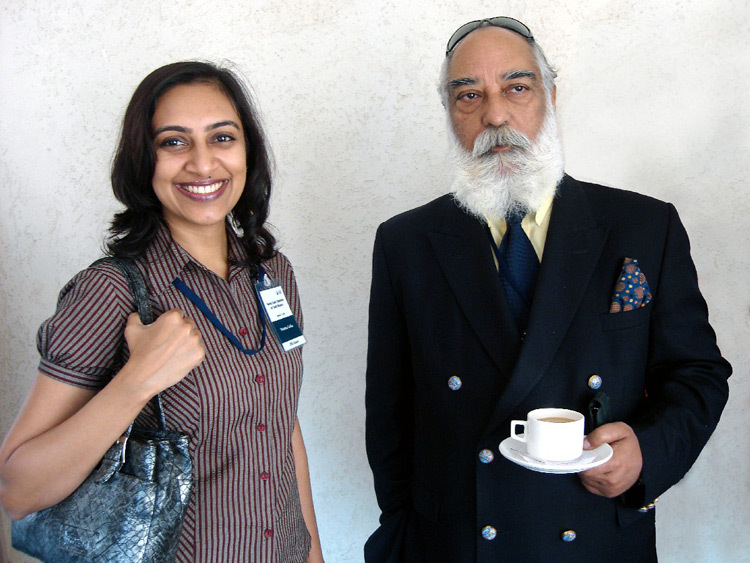 The House of Mewar’s association with Indian School of Business, Hyderabad, began in February 2008 when Shriji Arvind Singh Mewar attended the first ISB Asian Invitational Conference on Family Business Management in Hyderabad as a delegate. 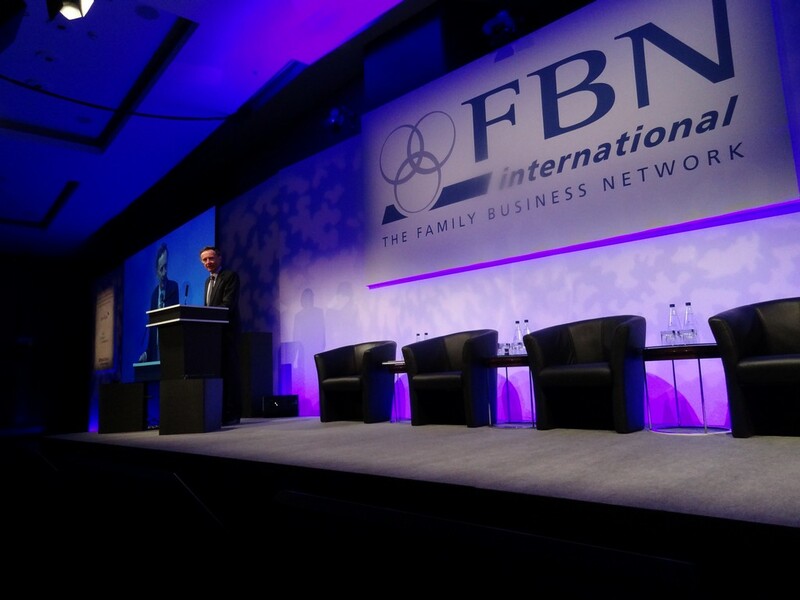 The theme of the conference was ‘Sustaining Growth in Family Business’. 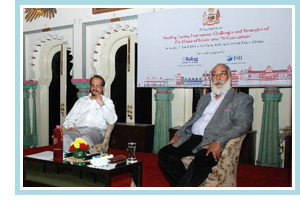 Shriji invited Prof John L Ward, Clinical Professor of Family Enterprises at Kellogg School of Management of the Kellogg School of Management, Chicago, and Prof K Ramachandran, Thomas Schmidheiny Chair Professor of Family Business and Wealth Management at the Indian School of Business, Hyderabad, to prepare in-depth case studies on the House of Mewar for the benefit of not only management students and researchers worldwide, but also to develop an evolving document – a manual, as he said – for the present and future generations of the House of Mewar. Across the world only a limited number of families have survived beyond a few generations, distinctly retaining their identity in terms of vision and values, and evolved as institutions. The royal family of Mewar is unique in that it has successfully sustained itself beyond 76 generations. This research case on the House of Mewar has identified factors such as trusteeship and service to society as the core strengths that have contributed to the creation of this institution. Although, the trusteeship responsibility of administration of the state has been transferred to the government, the family has ensured that its moral responsibility to preserve the history and traditions and enriching the society has remained high. 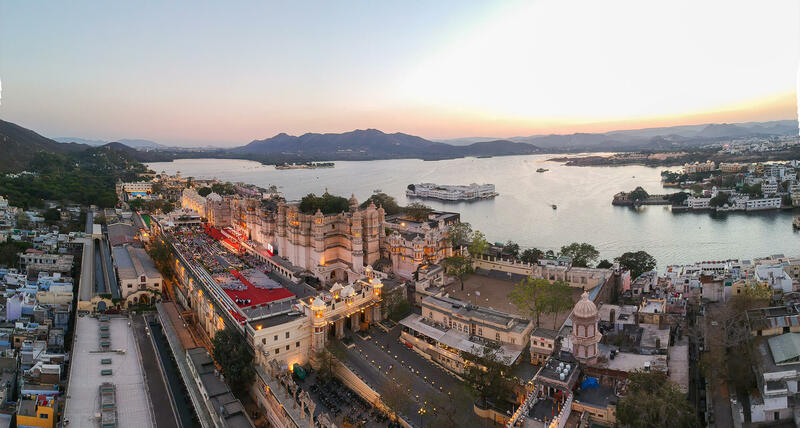 It has not only preserved the ancestral properties with history of centuries behind, but also brightened the image of Udaipur as a tourist centre. In the process it has created employment opportunities for a large number of people. 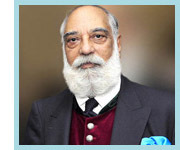 Shriji Arvind Singh Mewar’s painstaking efforts to build on what he inherited under difficult times, that too when he was the one ‘chosen to rule’ shows the leadership qualities required to practice trusteeship values. His children have demonstrated commitment and capabilities to preserve the traditions and responsibilities entrusted on them. 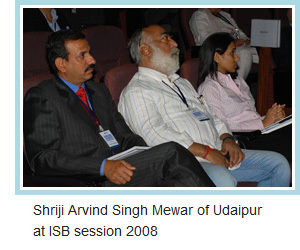 From February 1-3, 2008, Shriji Arvind Singh Mewar, Mr Jitendra Singh Rathore and Mr Raju Mansukhani attended the first ISB Asian Invitational Conference on Family Business Management in Hyderabad as delegates. 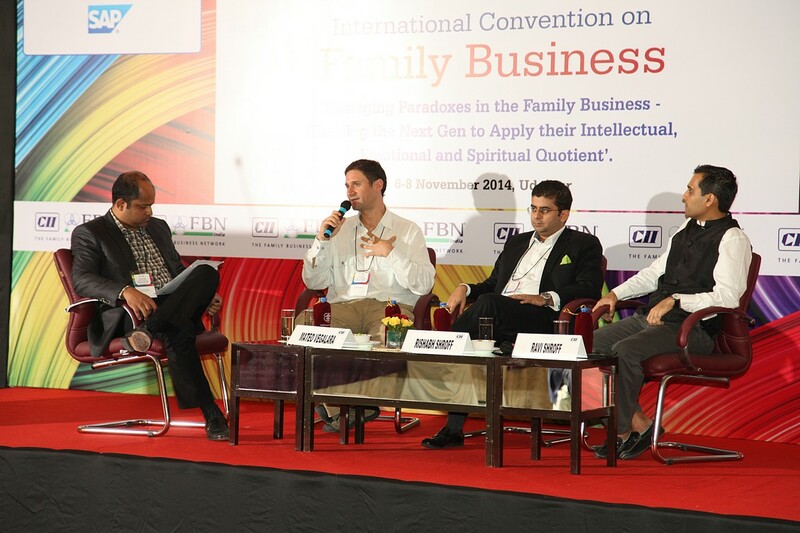 The theme of the conference was ‘Sustaining Growth in Family Business’. 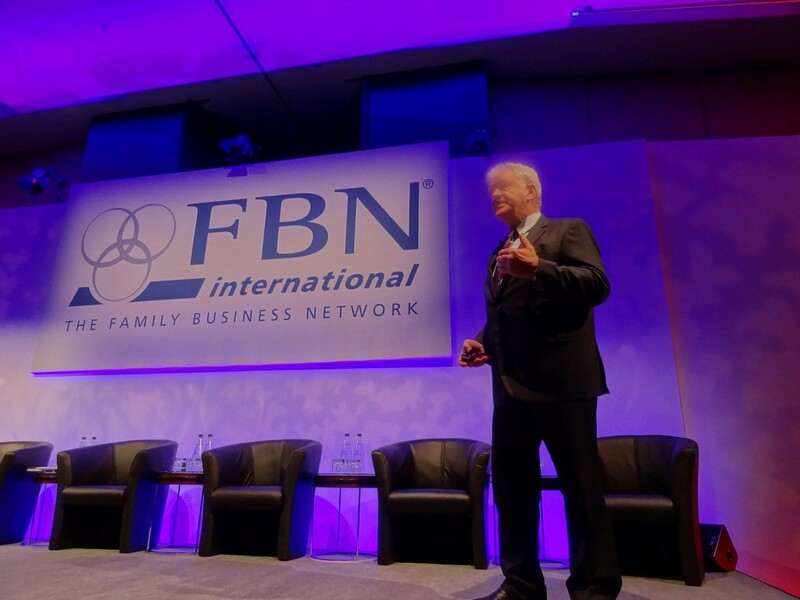 The keynote address, by Prof John L Ward, Clinical Professor of Family Enterprises at Kellogg School of Management, held the august audience spellbound as he enunciated the strengths of family businesses across the world. 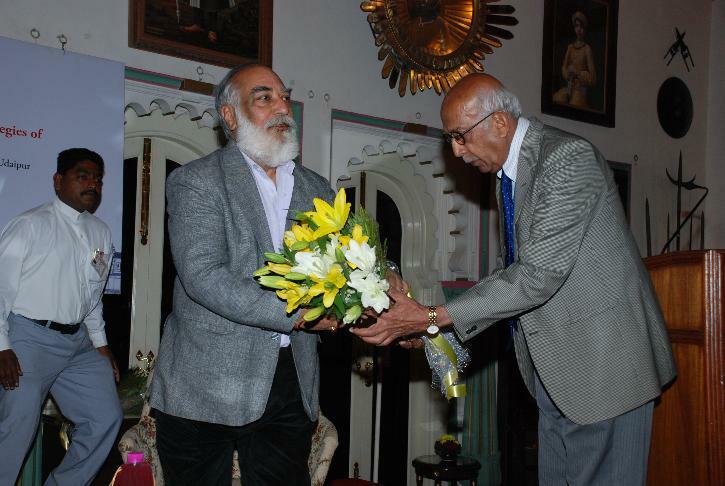 Intense interactions during the conference with Prof John L Ward and Prof K Ramachandran resulted in Shriji's extending an invitation to the management gurus to visit Udaipur and begin the task of working on the House of Mewar case studies. Prof John L Ward said, "I treasure this gift of a case that you are giving us, Shriji!” Besides being the Clinical Professor of Family Enterprises at Kellogg School of Management, Prof Ward is a visiting lecturer at IMD Lausanne; Hong Kong University of Science and Technology, Indian School of Business, Hyderabad and IESE at Barcelona. 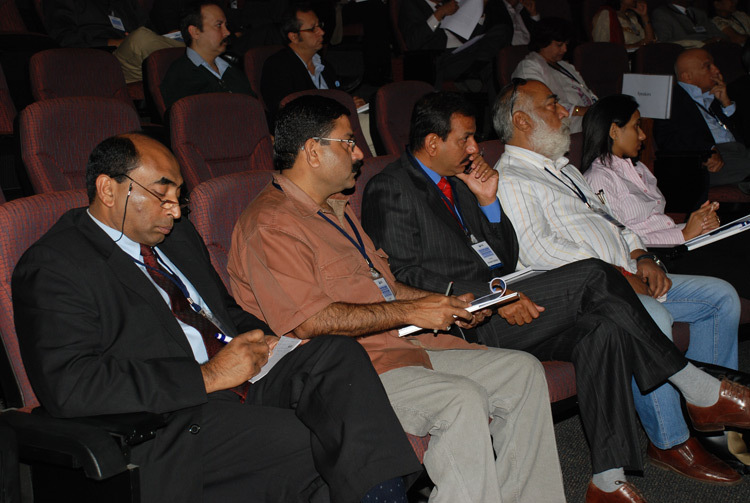 The second ISB Asian Invitational Conference on Family Business Management was held from February 7-8, 2009. 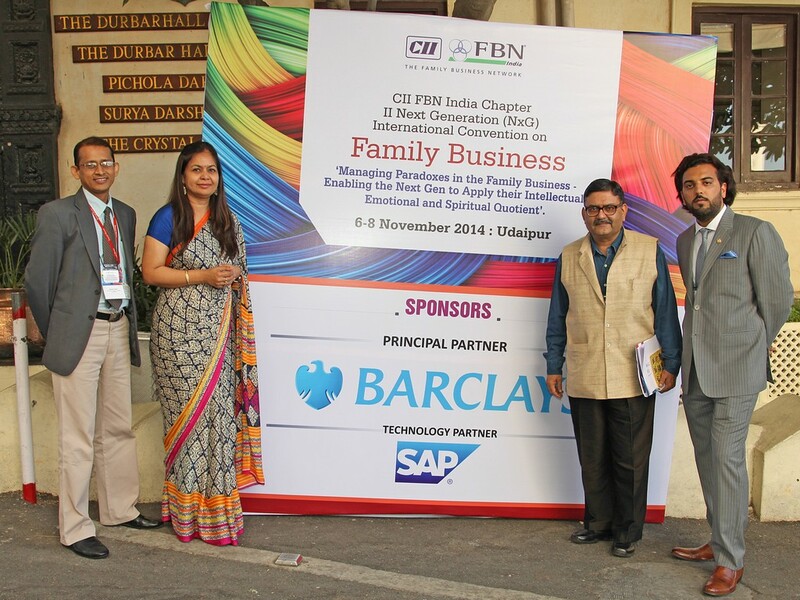 The theme of the conference was Building a Lasting Family Business – Dream to Reality. 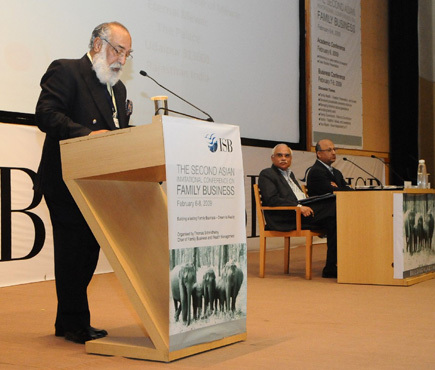 Shriji Arvind Singh Mewar was invited by ISB as a key speaker in the session on 'Family Tradition, values and Leadership'. 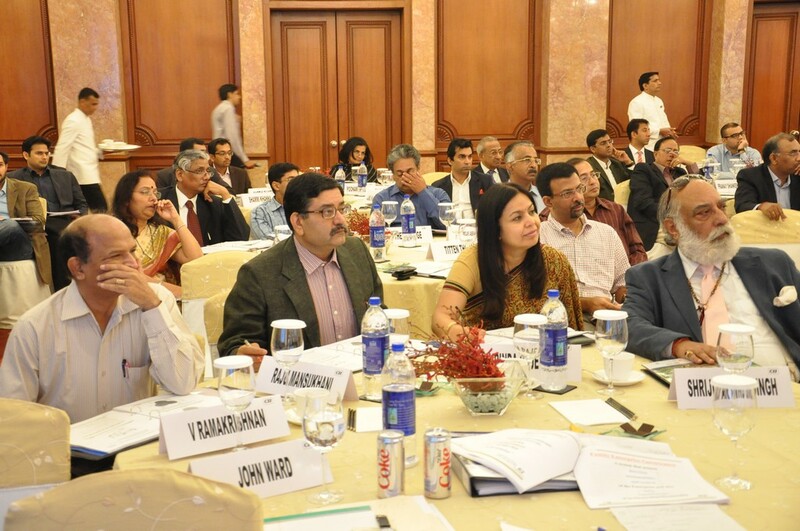 The session was chaired by Mr P M Kumar. 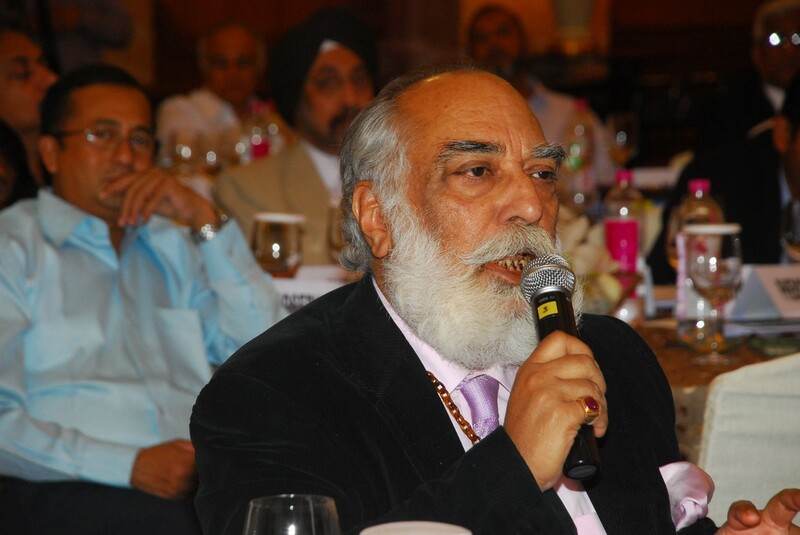 In his presentation, Shriji explained the role and responsibilities of Custodianship upheld by the House of Mewar. 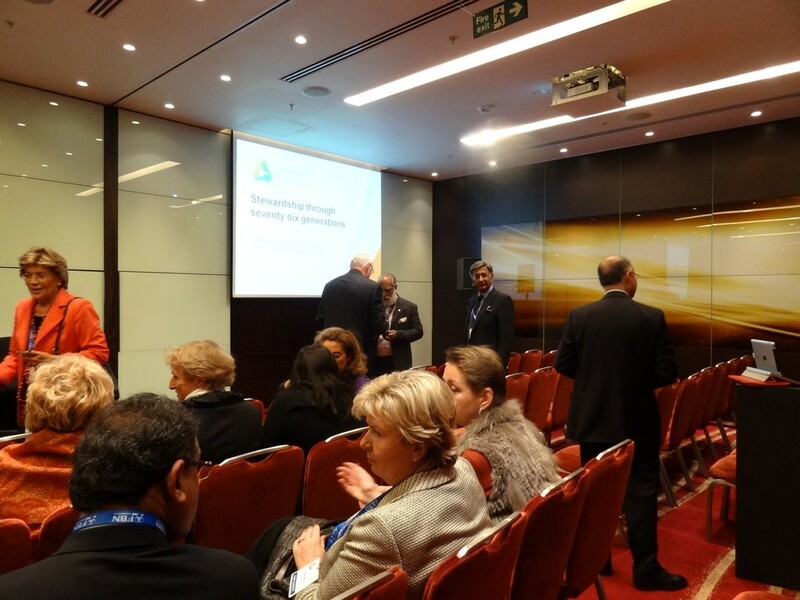 He spoke to an auditorium filled with senior academicians from India and overseas, as well as members of leading business families, management consultants and students. His presentation encompassed the founding of the Mewar dynasty in the 8th century, and its progress through the 20th century, to the institutionalization of its values which provide the ‘continuity and perpetuity’ to the House of Mewar. 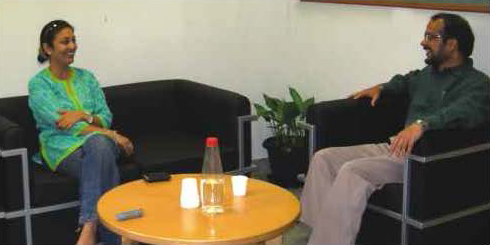 Through 2008 to 2010, Prof John L Ward and Prof K Ramachandran initiated in-depth interviews with Shriji and included all the family-members: Mrs Vijayaraj Kumari Mewar, Ms Bhargavi Kumari Mewar, Ms Padmaja Kumari Mewar and Mr Lakshyaraj Singh Mewar. 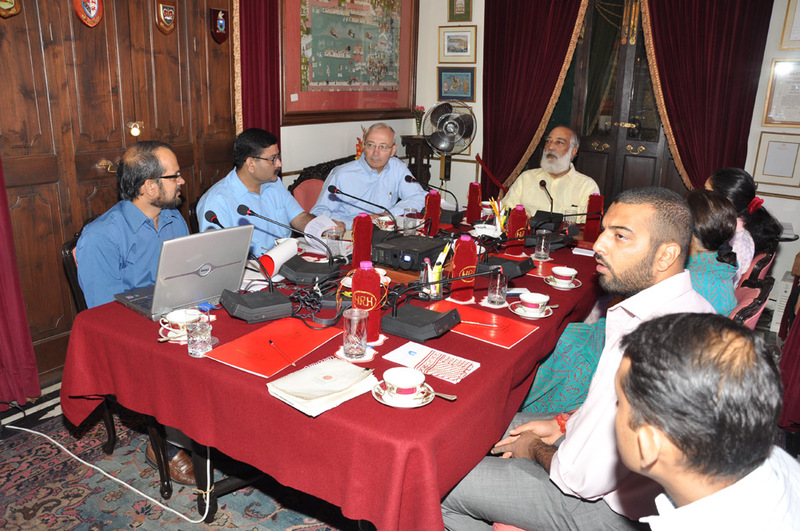 There were meetings held in Udaipur and at Hyderabad. The interviews and research led to introspection, thinking, re-thinking, re-visiting critical issues about Mewar's history and the role, responsibilities of its Custodians. 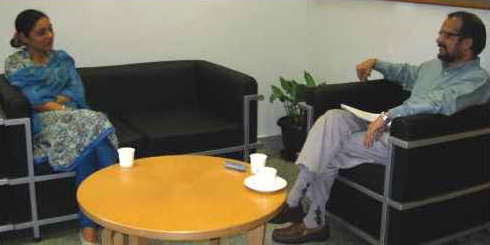 Prof K Ramachandran’s first visit from May 5-7, 2008 was followed by Ms Rachna Jha, the researcher from ISB in August-September 2008, who collected documents and material in Udaipur. 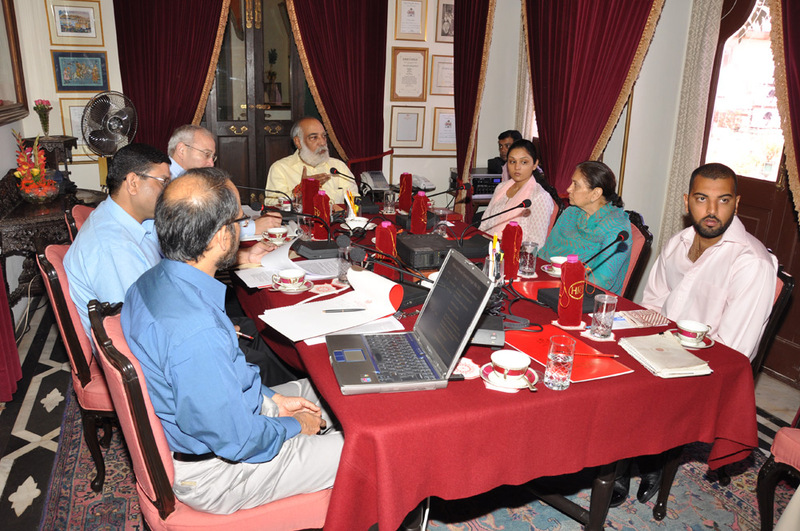 The audio recordings of interviews with Shriji Arvind Singh Mewar and family-members have been catalogued and preserved for future research. 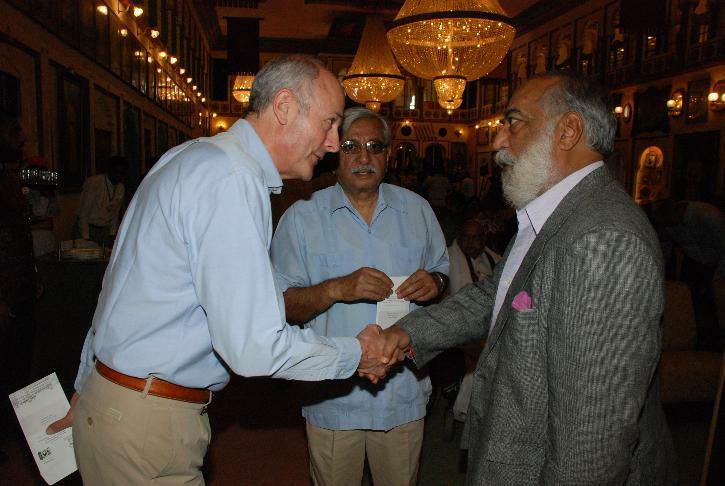 Prof John Ward and Prof Ramachandran visited Udaipur from October 21-22nd, 2009. 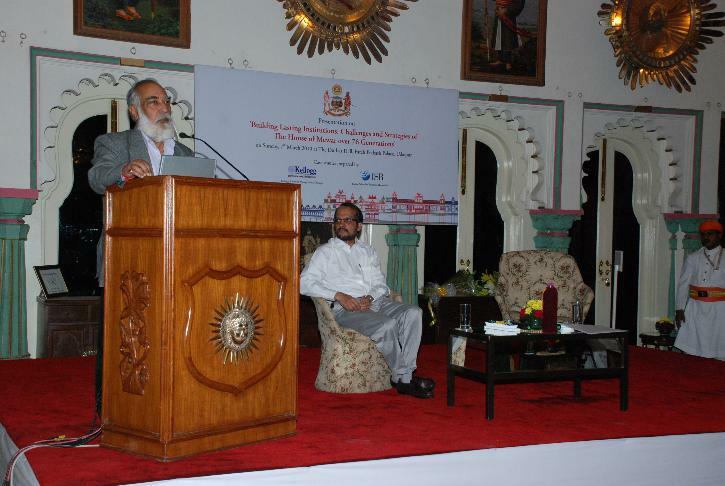 The House of Mewar case study research was reviewed and the Professors had an in-depth four-hour long discussion/presentation at the Shambhu Niwas Palace conference hall. 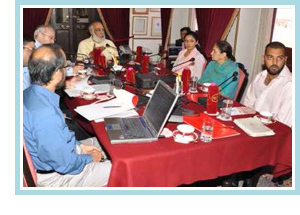 Shriji Arvind Singh Mewar, Mrs Vijayaraj Kumari Mewar, Ms Padmaja Kumari Mewar and Mr Lakshyaraj Singh Mewar were presented and actively participated in the discussions. March 7, 2010 was a landmark day for the House of Mewar as it marked the 30th Year of the Maharana Mewar Foundation Awards. 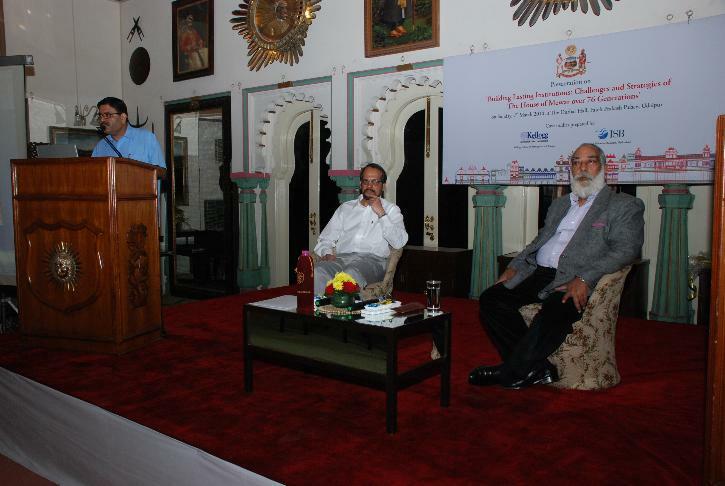 To coincide with the momentous occasion in Udaipur, Prof K Ramachandran, Thomas Schmidheiny Chair Professor of Family Business and Wealth Management at the Indian School of Business, Hyderabad, made a special presentation on the House of Mewar case study at a glittering function at The Durbar Hall, Fateh Prakash Palace. 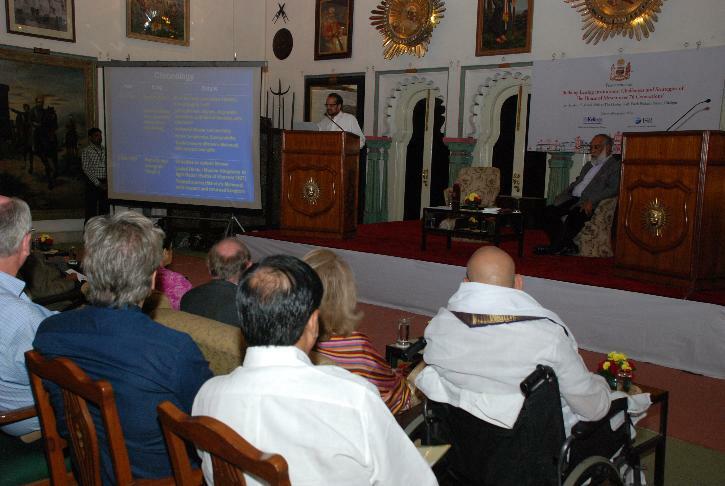 Titled ‘Building Lasting Institutions: Challenges and Strategies of the House of Mewar over 76 Generations’, Prof Ramachandran’s presentation took the audience through critical junctures in the history of the House of Mewar. He highlighted the key contributions of different Maharanas of Mewar whose commitment towards trusteeship provided the continuity and perpetuity of the House. 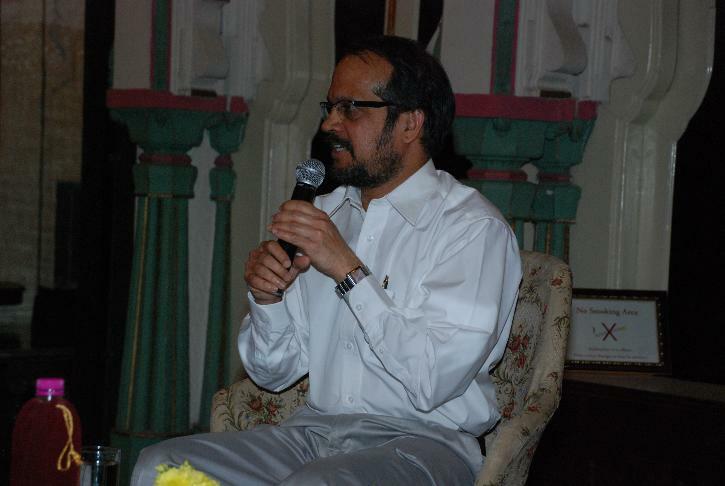 Prof Ramachandran’s presentation was an analysis of the unique capabilities and characteristics that have enabled this family to survive without a break for such a long time, and adapt to the challenges of upholding the trusteeship responsibilities entrusted by Shri Eklingji 76 generations ago. 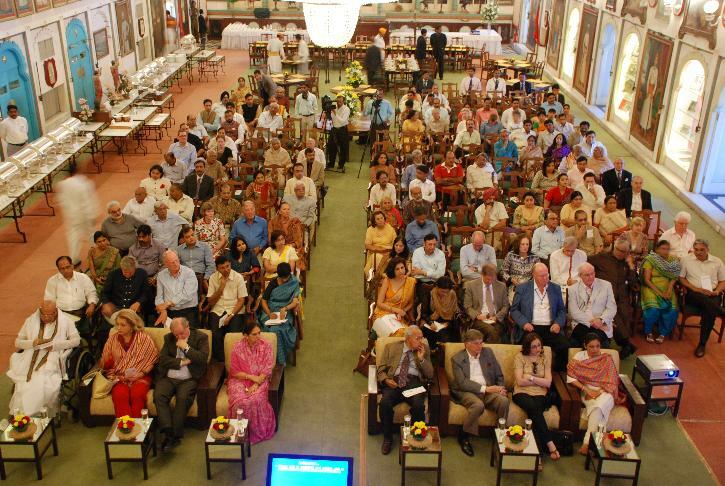 The Durbar Hall was packed with dignitaries, guests, mediapersons from all over the world and a lively interaction followed after Prof Ramachandran’s presentation. I believe you're now a business school case study? Yes, the Indian School of Business (ISB) Hyderabad, along with Professor John Ward of Kellogg School of Management, has written a case study on our family called India's Mewar Dynasty. They've looked at things from the succession management point of view. One of the questions for classroom discussion is 'Has Shriji played his role well?' The students are probably going to tear me apart. Does management as a subject interest you? Hugely. I've attended several family business management courses at ISB and I'm constantly thinking about management issues. Leadership fascinates me the most, especially the aspect of how leaders are produced. Issues of succession and division are very important in India. Whether it is the Tatas or the Birlas, every business house started as a family. The Birlas have done well because they have embraced change. Otherwise people tend to hold on to old ideas too long. 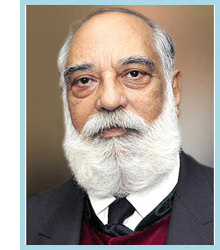 I WAS born in Udaipur in Rajasthan in 1944, three years before India achieved independence. Udaipur was founded in 1559 by my forefather Udai Singh. The new Indian democracy meant that families and clans like ours, princely states headed by maharanas, maharajas and nizams, were stripped of their property and governing rights. In 1971, the government took away our privileges, including financial stipends. My father, Bhagwat Singh Mewar, was the 75th in an unbroken chain of maharanas dating back to 734 A.D. who served as custodians of our region. In our tradition, we hold our possessions and authority in trust, passing them from generation to generation. We still uphold these traditions as a moral — not constitutional — responsibility. 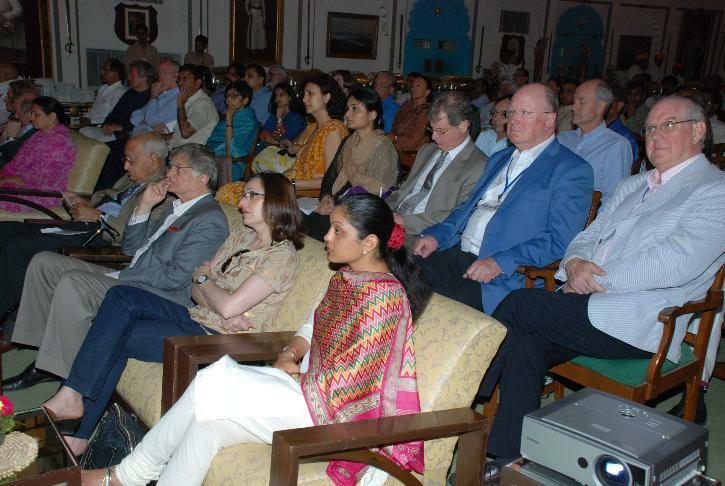 Two of the world's most distinguished professors of family business last week gave a periscope view of an ongoing study examining the Mewars of Udaipur, Rajasthan. What, you never heard of the House of Mewar? Never heard of their product? If you're not from India or an Indo-phile, you're probably not alone. Neither have Tom Peters, Stephen Covey, Peter Drucker or Ken Blanchard. In fact, had Blanchard heard of the Mewars, he might have recast his book "The One-Minute Manager" as the "The One-and-a-Half-Millennium Manager." Doing so, he probably would have sold more than the measly 13 million copies he did peddle. 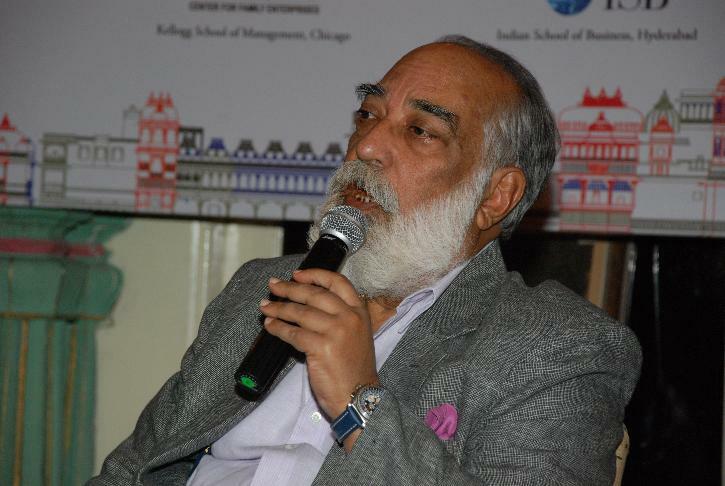 Even Professor John Ward, co-director for the Center for Family Enterprises at Northwestern University's Kellogg School of Management, was impressed when Professor K. Ramachandran, colleague on the other side of the globe specializing in Family Business and Wealth Management at the Indian School of Business (ISB) in Hyderabad, suggested studying the Mewars. After all, Dr. Ward had already looked at family businesses he thought were very old - businesses that went back only to 1526 and 1299! For the 1500-year old House of Mewar, acknowledged as the world's oldest-serving dynasty, every century has been fraught with challenges and transformations. Momentous events have, time and again, tested the enduring legacy of Custodianship and the Custodian's commitment to continue serving as the Diwan of Shri Eklingji, preserving core values of the House of Mewar. In the State of Mewar, critical issues regarding the Royal Family were decided by competent authorities of the State. 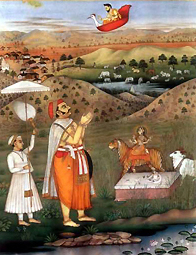 Wealth management, equitable distribution of assets, and succession planning according to the rule of primogeniture, were issues for which there were well-established precedents for the State of Mewar to follow. The precedents and rulings adhered to principles of, what modern management terms today as, consensus management and conflict resolution. During this period of established judicial and legal systems there was a continuity of interpretation provided by senior administrators, jurists and legal luminaries. 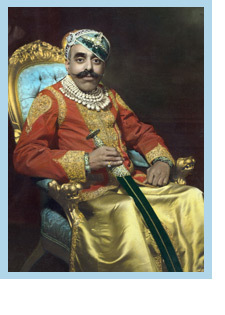 Mahendraj Sabha was the highest judicial council of Mewar and the Maharana was its President to ensure continuity and uniformity of interpretation. In 1947, India gained Independence from British Rule. The State of Mewar was now merged into the Union of India. The State of Mewar’s judiciary, revenue systems, army, police force, educational system and day-to-day governance were handed over to the Government of India. In effect, the governing apparatus of the State of Mewar was dissolved. The President of India was now, under the new Republic, the approving authority regarding all matters of succession in the country. This was required because the rule of primogeniture had to be followed at all times. The decision which was carefully taken by the President of India was final and binding. In this period of enormous political and social change, the system of Presidential authority ensured legal continuity and uniform interpretation in matters relating to succession in the Royal Families. 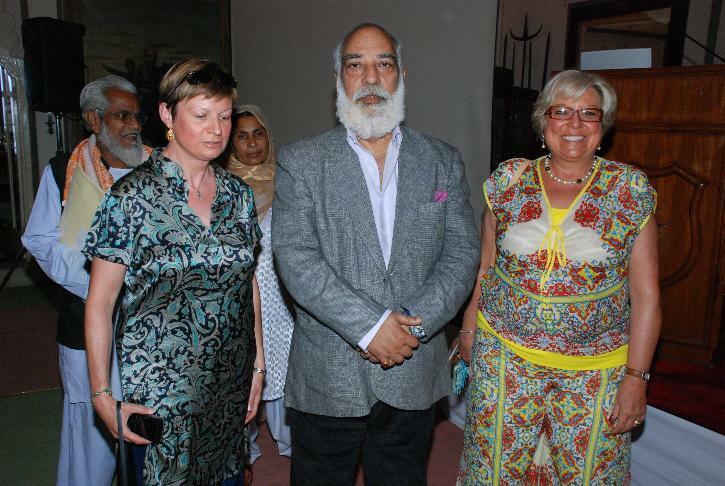 The members of the House of Mewar now became ordinary citizens of India. It was a period of unforeseen challenges. 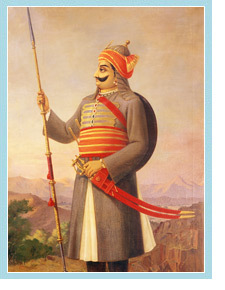 The 75th Custodian, Maharana Bhagwat Singh’s quest was to ensure that the Institution of Maharana remained in perpetuity and in accordance with Indian laws. His mission was to find futuristic solutions, for both the family and emerging businesses, in a democratic environment without compromising his duties and responsibilities as a Custodian. In 1984, a vacuum was created within the House of Mewar when the eldest son voluntarily seceded, during his father’s time, from the Family. As per the rule of primogeniture, the next in line had to step in and succeed. In the absence of a Constitutionally-empowered redressing authority, the rule of primogeniture was interpreted by individuals as it suited them, the House was now drawn into protracted legal battles. 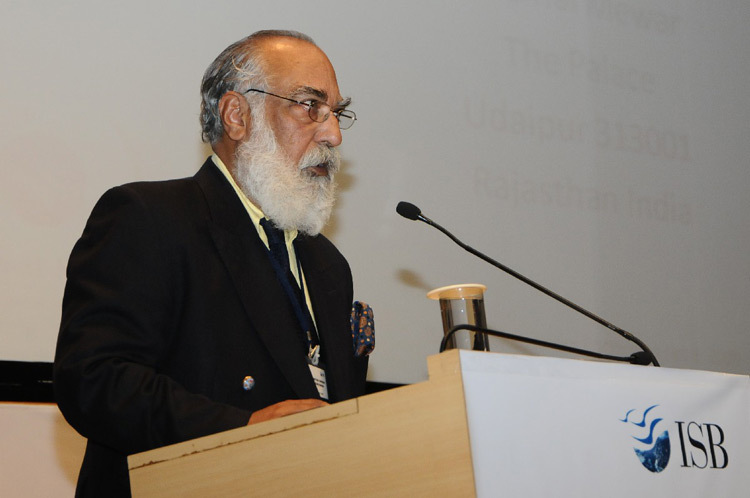 “There has thus been a dire need to put in place modern mechanisms that can address critical issues of both family management and business management in the present age,” says Shriji Arvind Singh Mewar, the 76th Custodian of the House of Mewar. “This is part of our quest to reinvent, re-strengthen the House of Mewar on legal pillars that are strong, stable, modern and progressive. It is a process that began in the late-1970s, during my father’s time, and continues till date,” he says. The Family Business Initiatives, undertaken since 2008 and documented on this website, are indicative of his quest to provide strategic leadership to the House of Mewar. Shriji is acknowledged as a pioneer in his generation who is contemporizing the legacy he inherited as the 76th Custodian of the House and keeping it relevant, connected to the real world at all times. He is also an exemplary role-model for other former Royal Families of India who may be reluctant to take the first steps towards a rational managerial approach to family and business affairs, which is the challenge of the time. 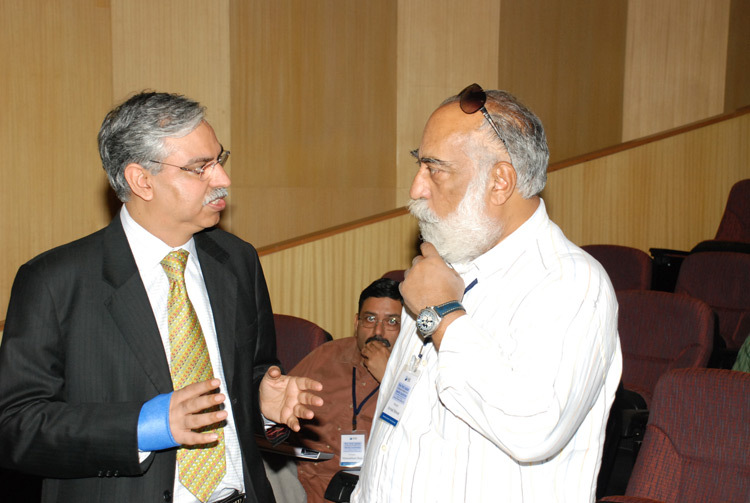 I have been a permanent faculty of the Indian School of Business ever since it was set up in 2001. 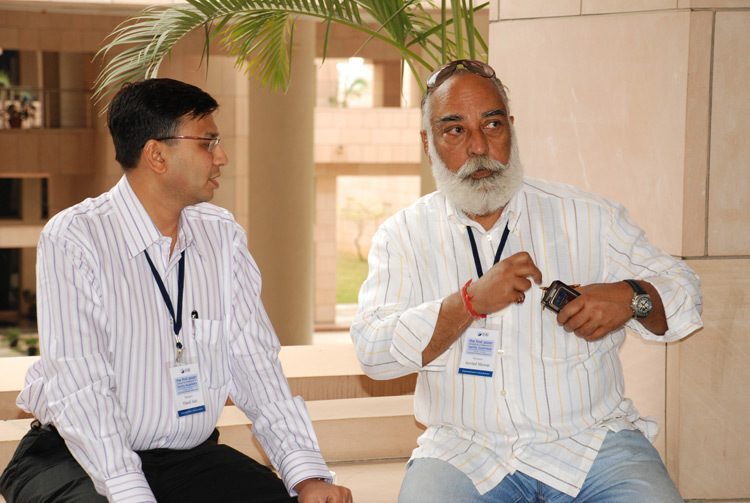 Prior to this I was the faculty of the Indian Institute of Management, Ahmedabad for over 15 years. My areas of specialisation are entrepreneurship and strategic management. 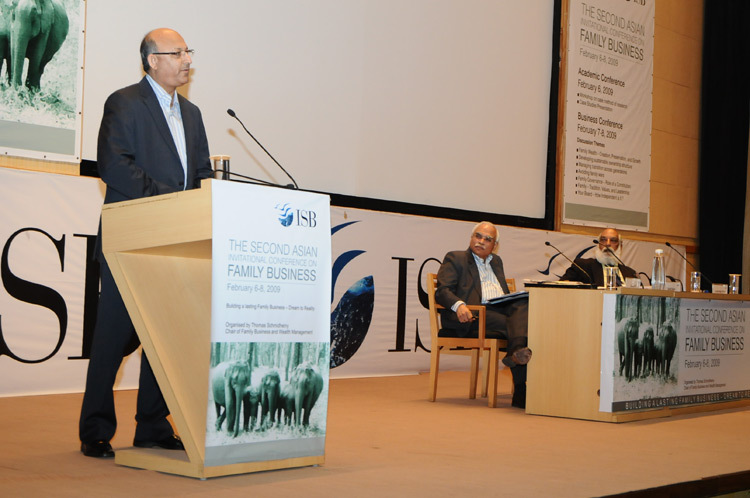 The Thomas Schmidheiny Chair on Family Business and Wealth Management organised the first Asian Invitational Conference on Family Business with the theme “Sustaining Growth in Family Business” from February 1-3, 2008 at the ISB. 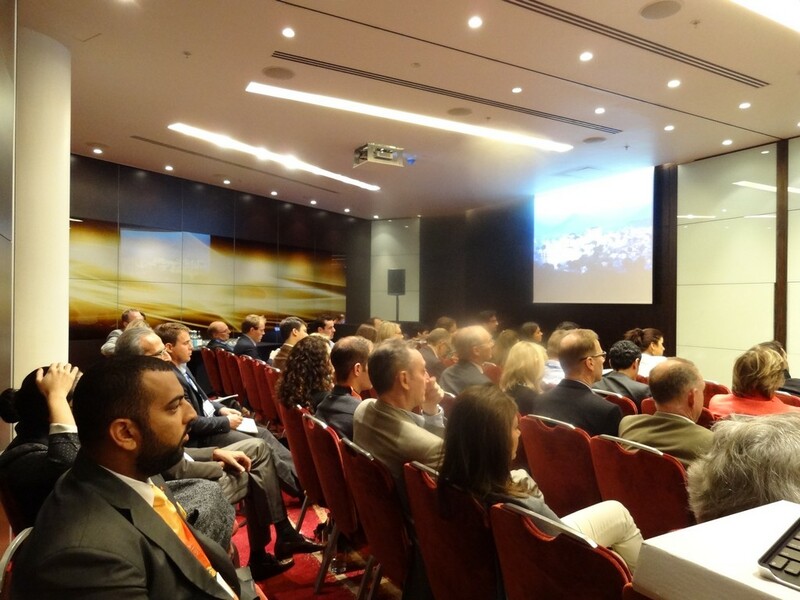 The London Summit will examine the role that the family business sector plays in driving growth and sustainable development across the world. Exploring the theme ‘Extraordinary Performance’ the Summit will identify the key drivers of family business success – and what the future may hold. 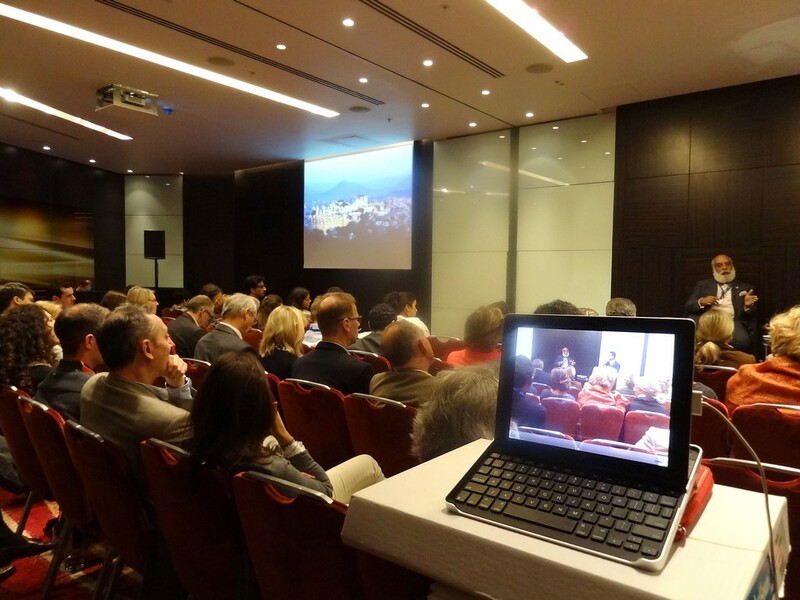 In the series of Extraordinary Performance interactive workshops delegates will hear live family business cases delivered by leaders, which will be enriched by expert views from our experienced moderators. Few families can claim continuity of existence for more than 76 generations either in business or otherwise. 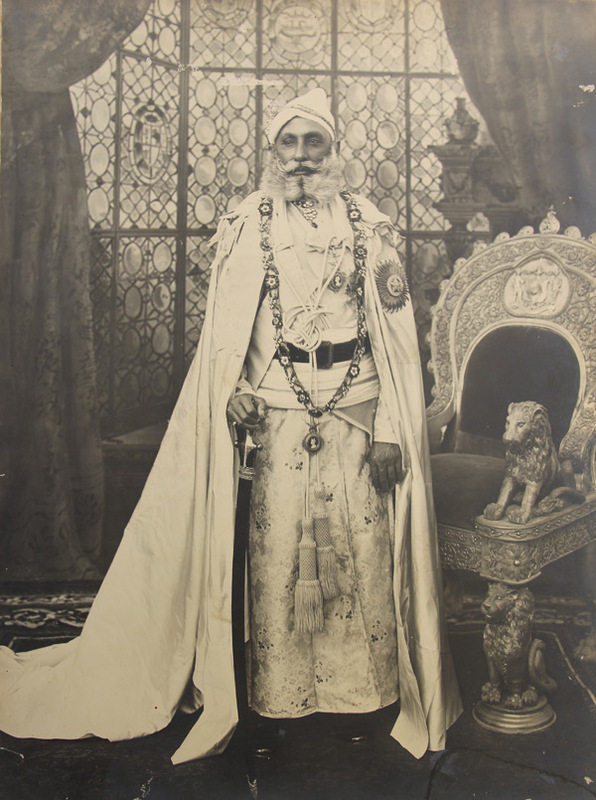 This workshop will showcase the House of Mewar, a family with an unbroken chain of custodianship for more than 13 centuries and which has had to diversify to protect its heritage and cultural legacy. 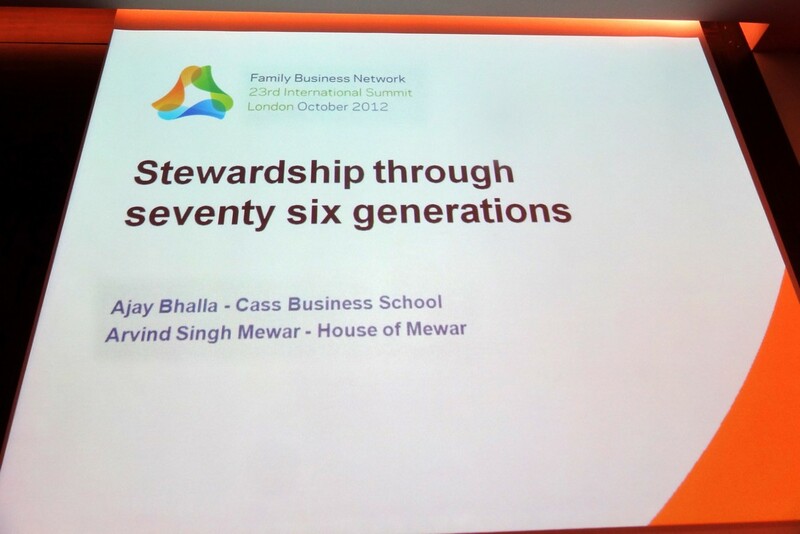 The family’s role as stewards not only of the business but of the territories in which they live has transformed both family and business and contributed to an enterprise which has demonstrated long-term sustainability. 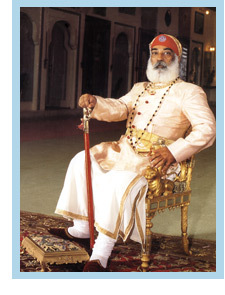 Arvind Singh Mewar of Udaipur (‘Shriji’) is the 76th Custodian of the House of Mewar in which position he has had the opportunity to handle wealth and inheritance received in bequest and what he has added by his worth. 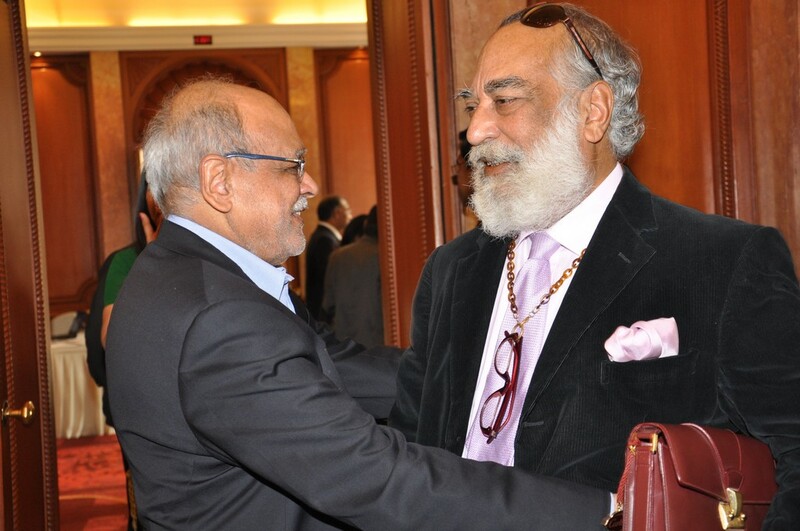 His efforts through the Maharana of Mewar Charitable Foundation (of which he is the Chairman and Managing Trustee), and HRH Group of Hotels (of which he is the Chairman), are symptomatic of his insights into investment.